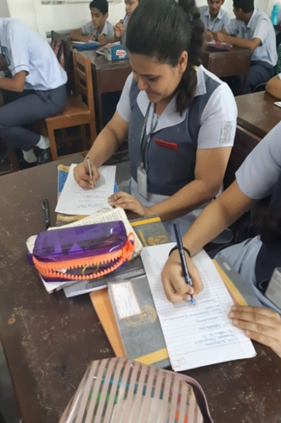 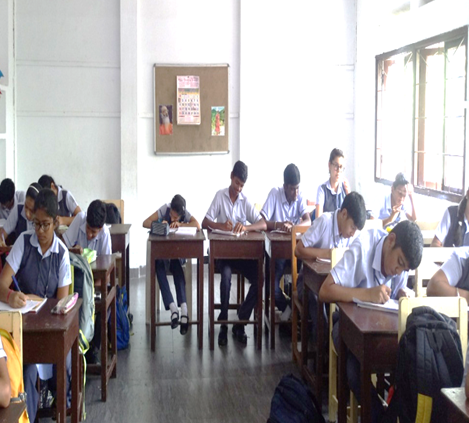 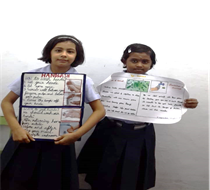 Students of Std 9 observed letter writing day on 14 September 2018. 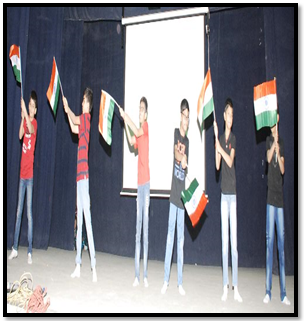 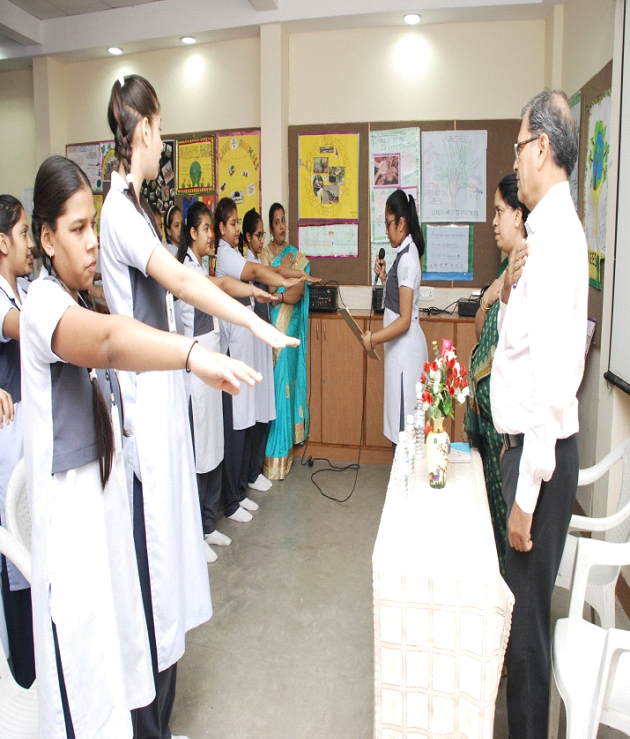 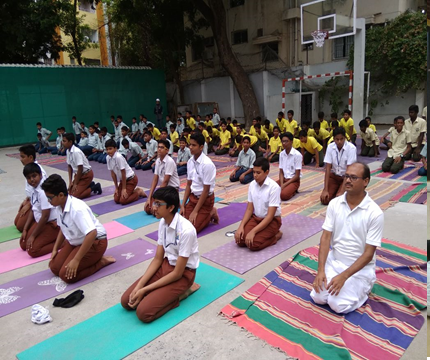 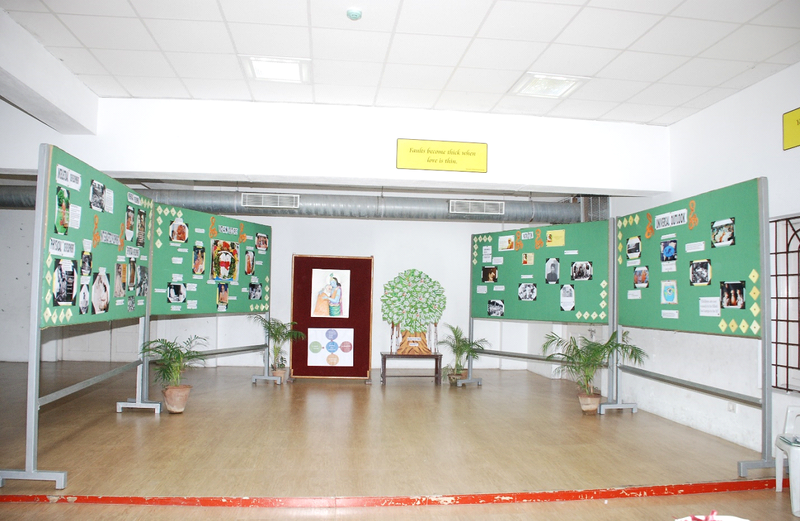 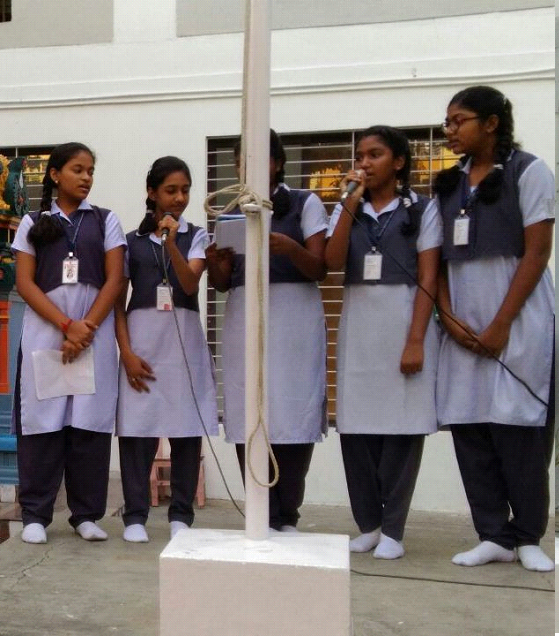 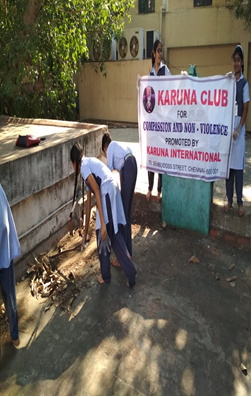 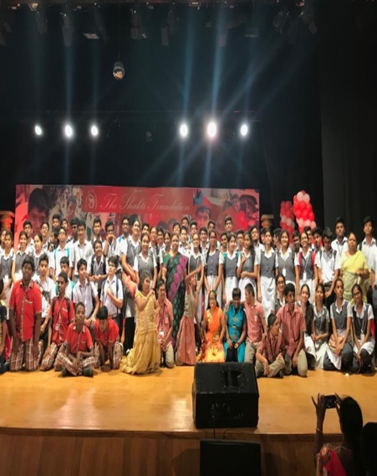 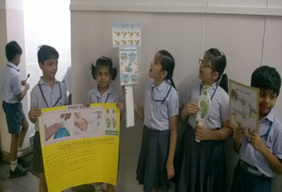 They expressed their opinions on the importance of cleanliness and all the Swachh Bharat programmes that have been organized in the school for over two weeks. 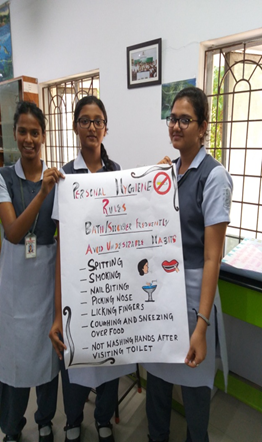 The 8th of September 2018, was marked as PERSONAL HYGIENE DAY. 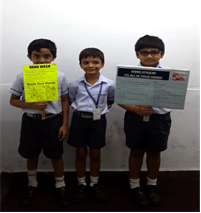 Posters were also put up in strategic locations in the school highlighting the rules to be followed for personal hygiene and the importance of personal hygiene. 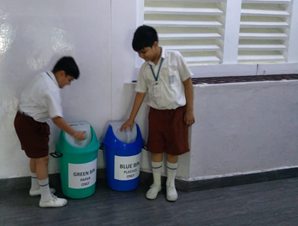 Segregation of waste as ‘Biodegradablewaste ‘[ Green bin ] and ‘Non-biodegradable waste’[Blue bin ] The students are encouraged to collect used notebooks and paper which is renewed to make a paper pad . 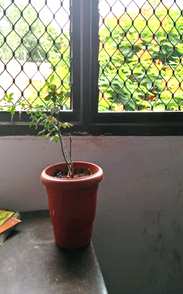 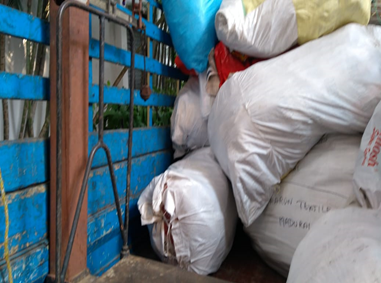 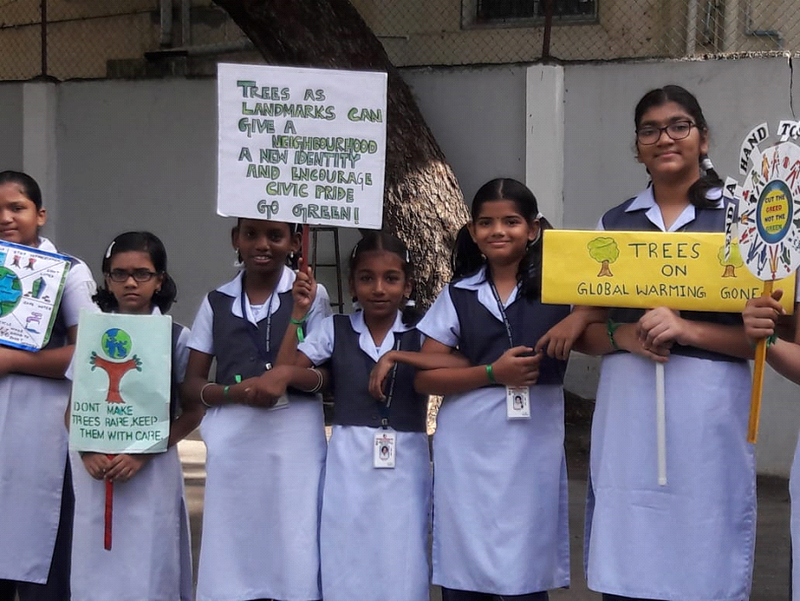 This ensures a proper usage of resources and also prevents wastage of paper.The School follows a tradition of donating saplings to the school for events like birthdays , National days Plant inside the classroom taken care by the class students. 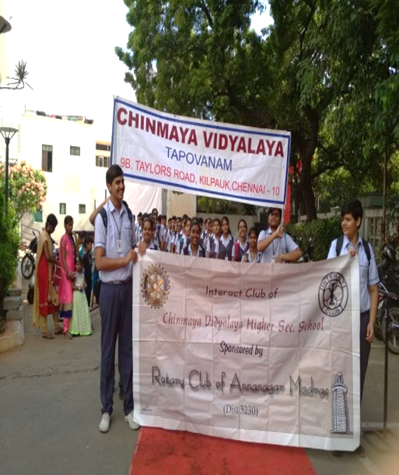 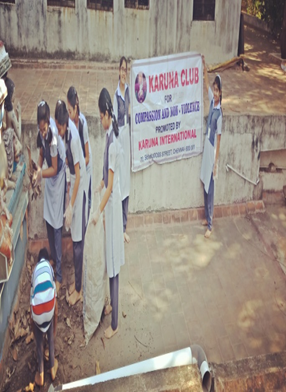 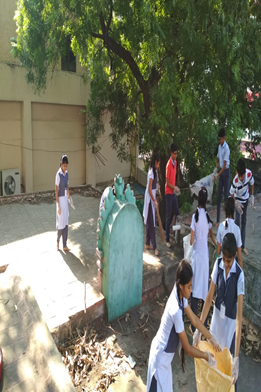 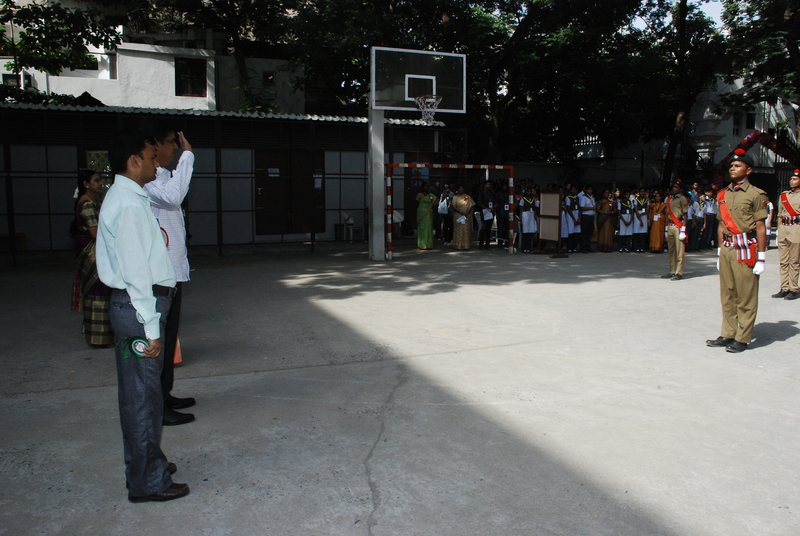 Hand Wash Day was celebrated in our Vidyalaya with a lot of enthusiasm and interest. 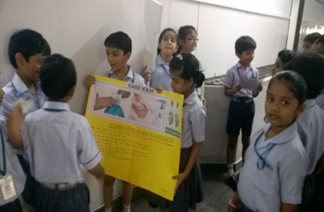 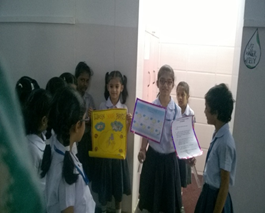 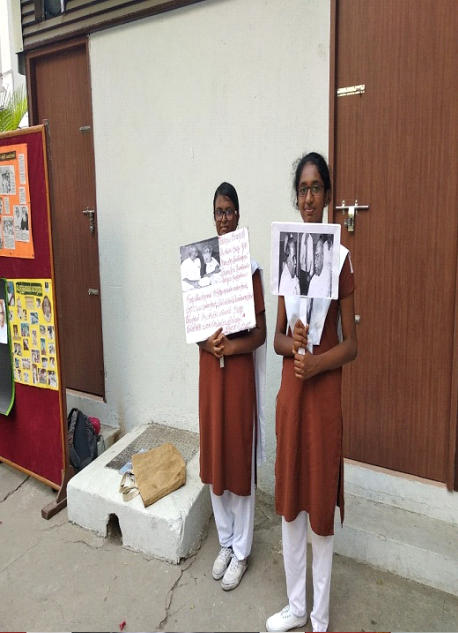 During the break, the students stood near the washrooms holding posters, placards and banners to spread the word about the importance of Hand Wash Day and to increase awareness about the benefits of hand washing with soap. 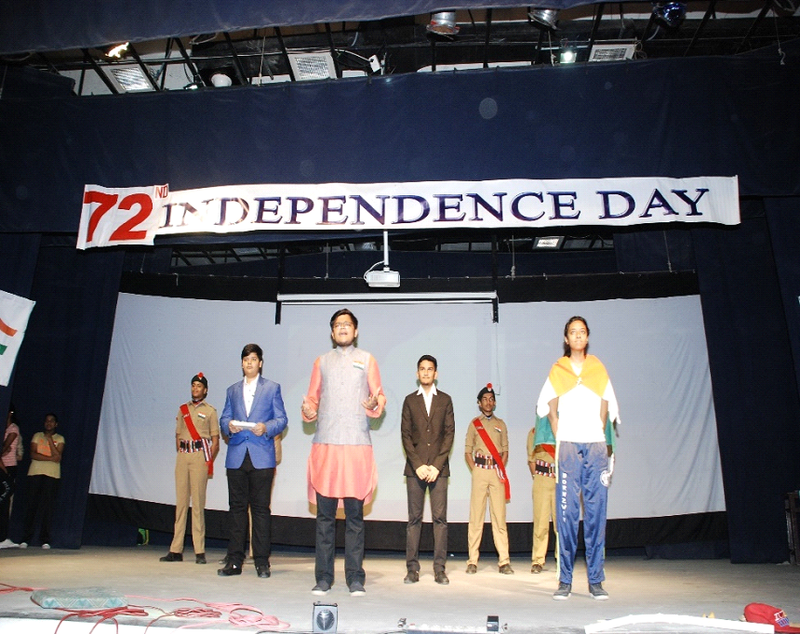 On 17th September , Principal Smt. 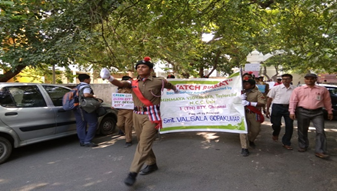 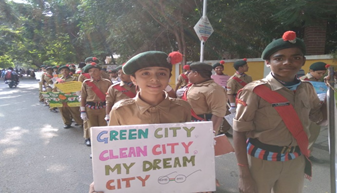 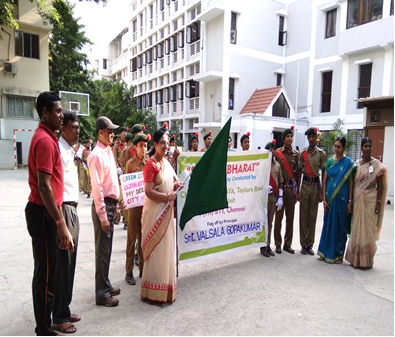 Valsala Gopakumar flagging off NCC Rally to spread the message of Clean City, Green city.NCC cadets take out a rally to spread the message of Clean City, Green city. 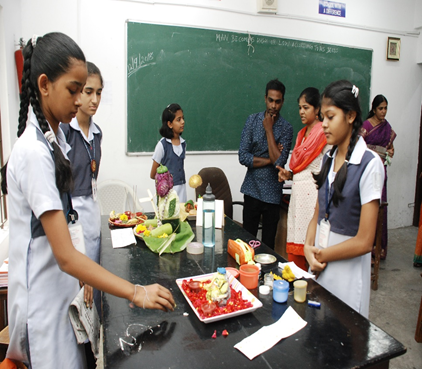 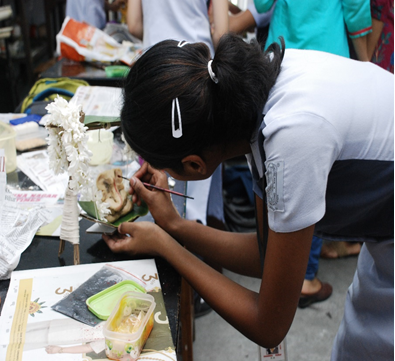 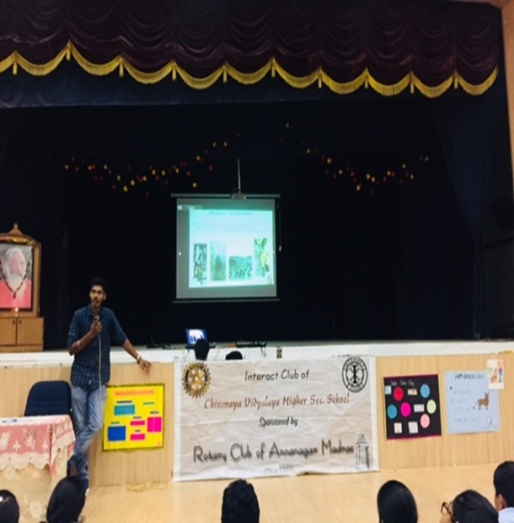 ‘Eco friendly Ganeshas’ were created and displayed by students as part of CCA conducted on 12th September 2018. 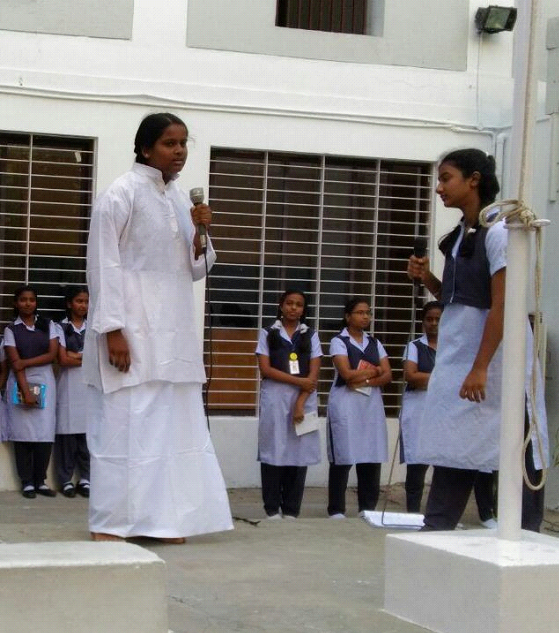 Bharathiyar Nenaivunaal was observed on his death anniversary on September 11th. 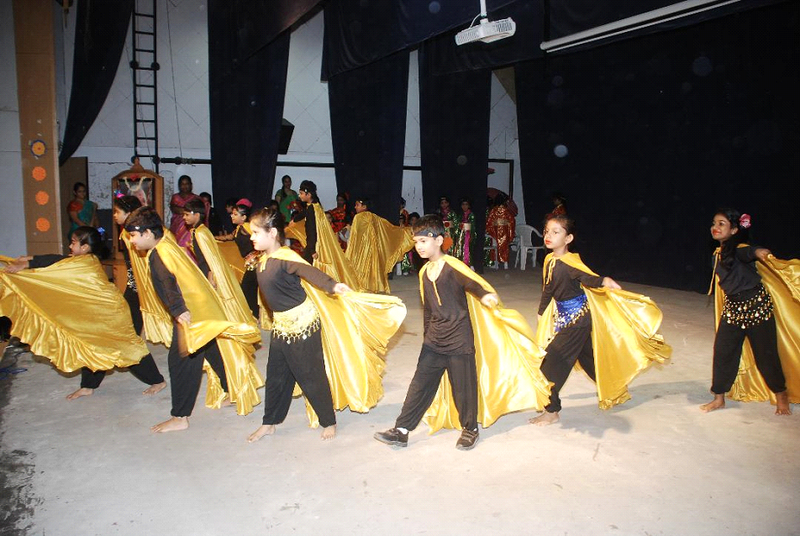 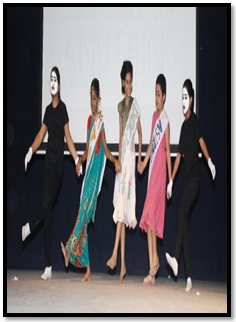 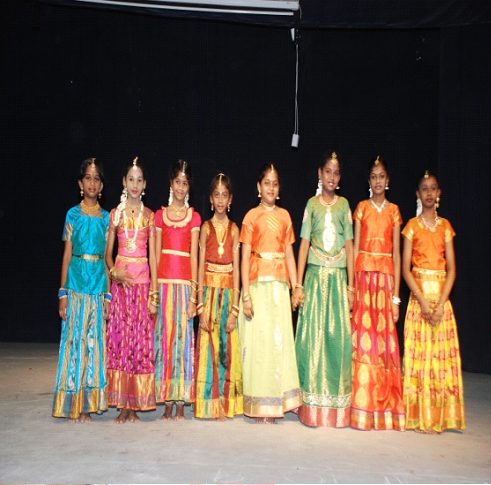 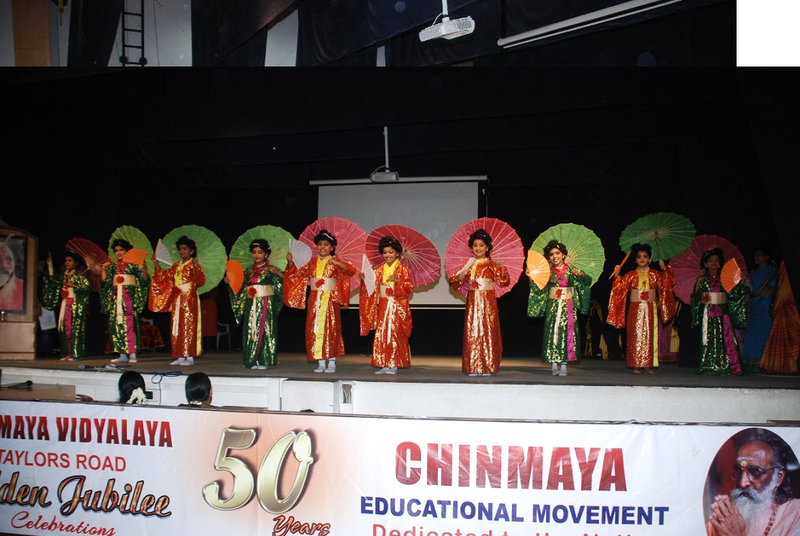 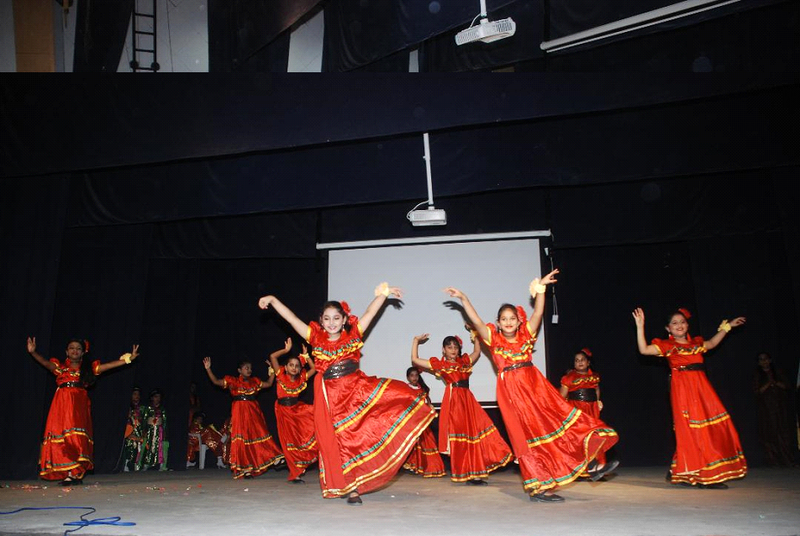 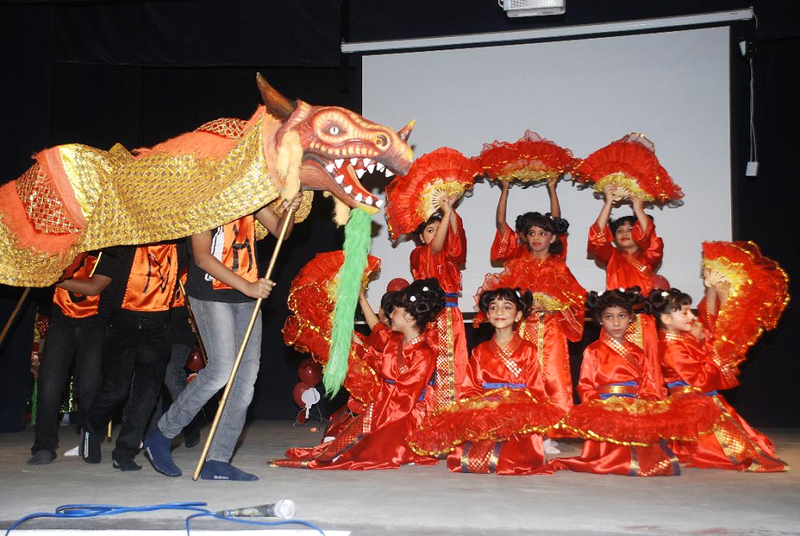 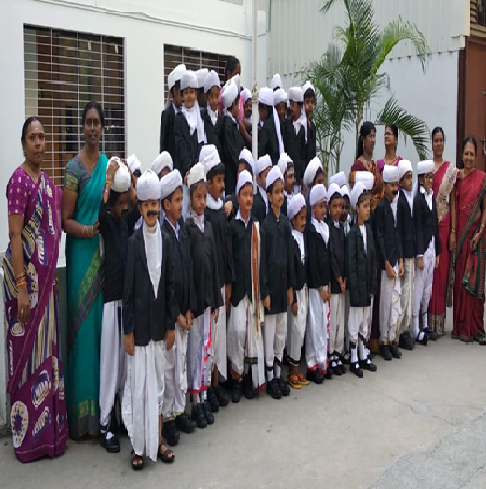 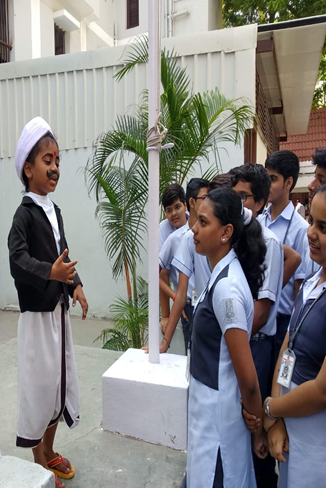 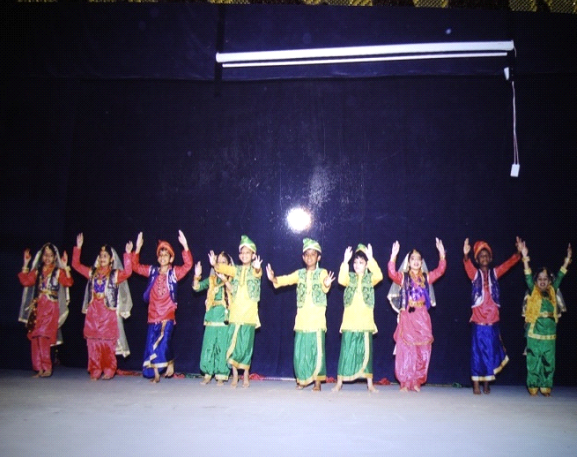 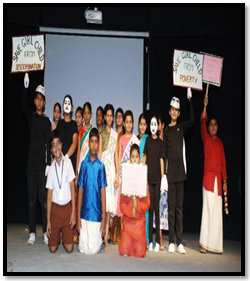 Students of Std 2 were dressed up as Bharathiyar and also sang the songs of Bharathiyar. 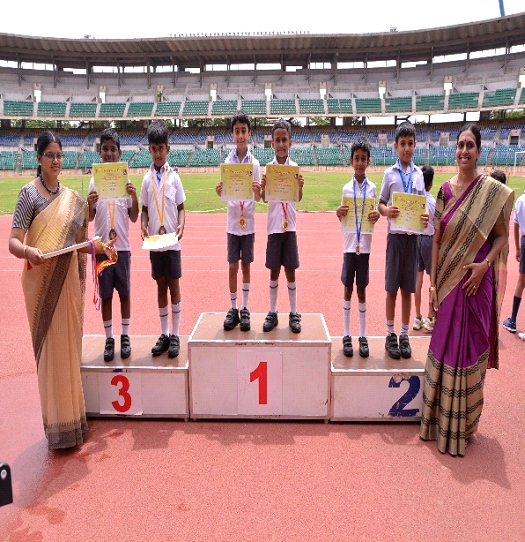 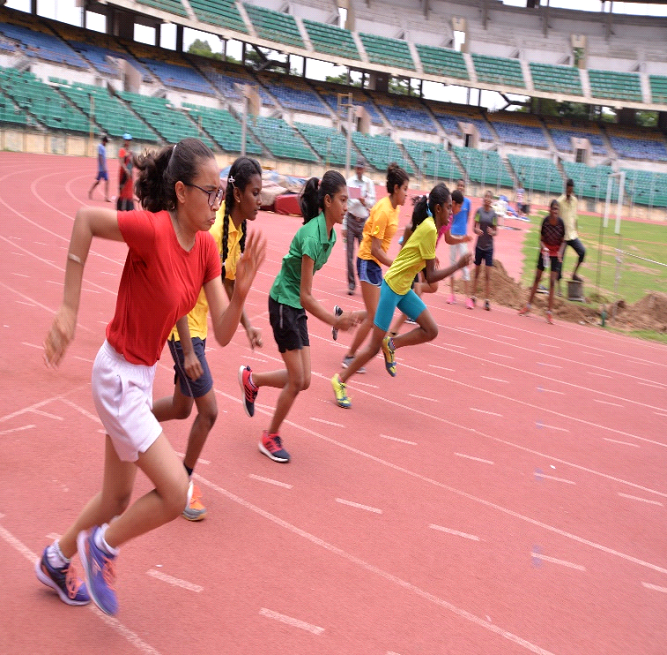 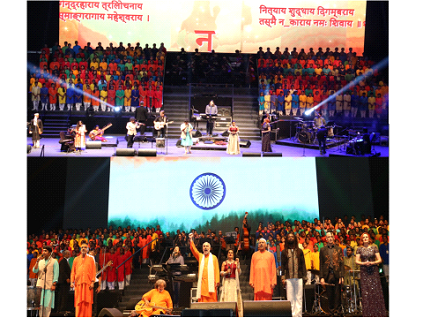 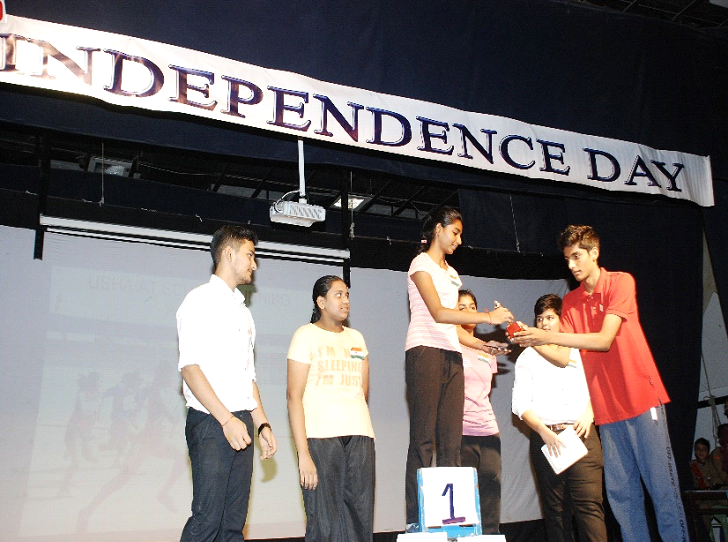 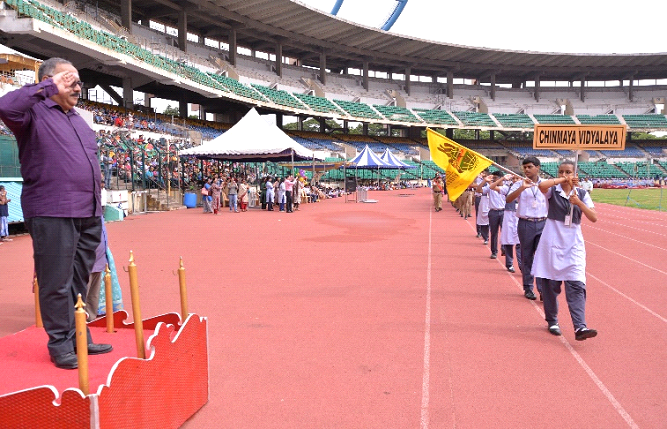 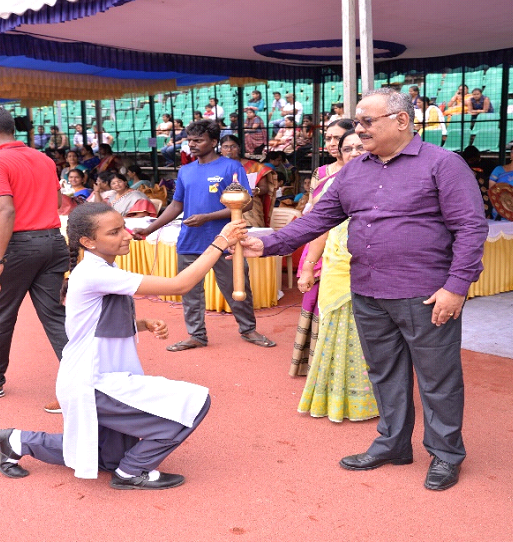 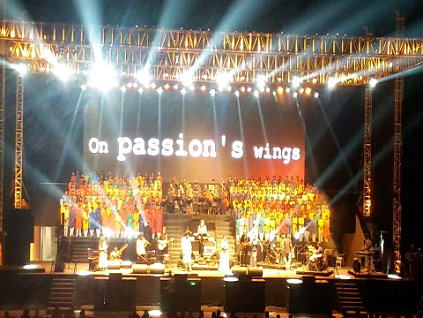 51st Annual sports meet was held on 28th August at Jawaharlal Nehru Stadium , Periamet. 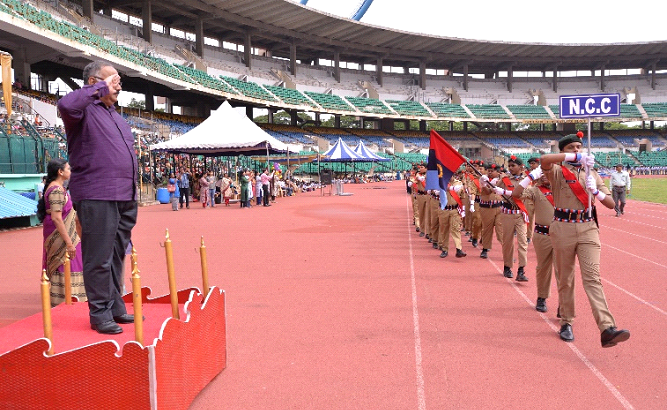 Shri N.Seshasai.,I.P.S, IG Welfare took the salute and declared the sports meet open. 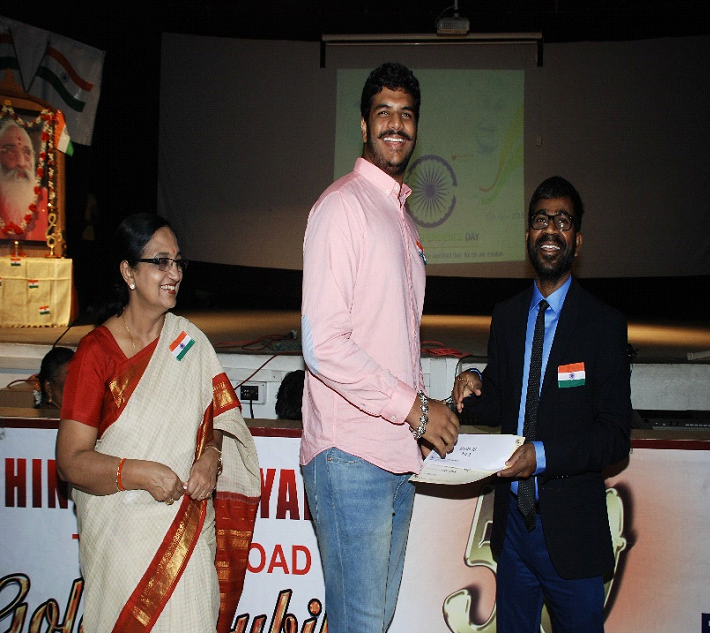 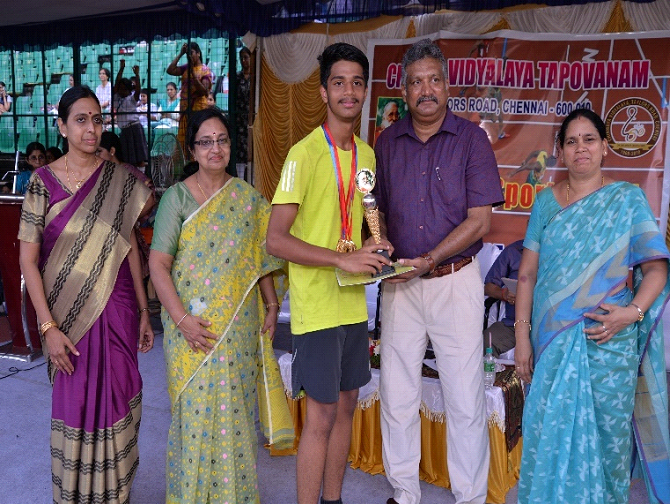 Shri.G.Kamalakannan,Jt.Secretary ,Zonal Sports Promotion Committee was the Guest of Honour and distributed prizes to the winners and the winning teams. 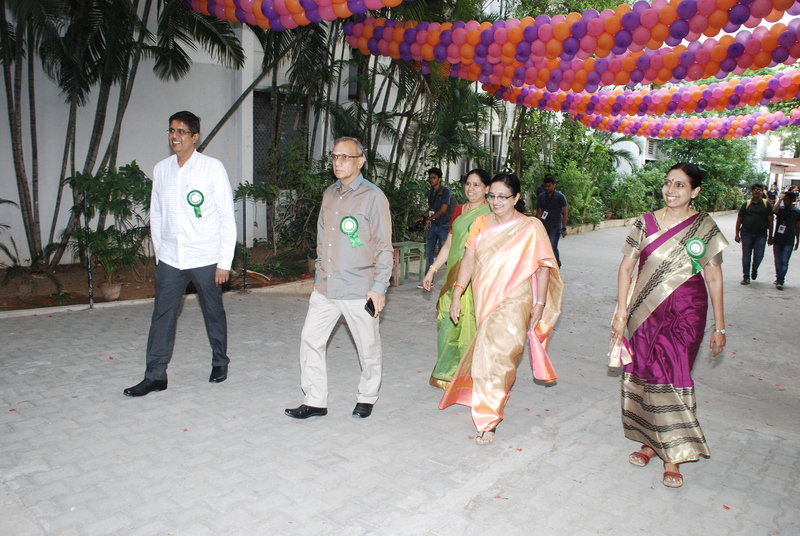 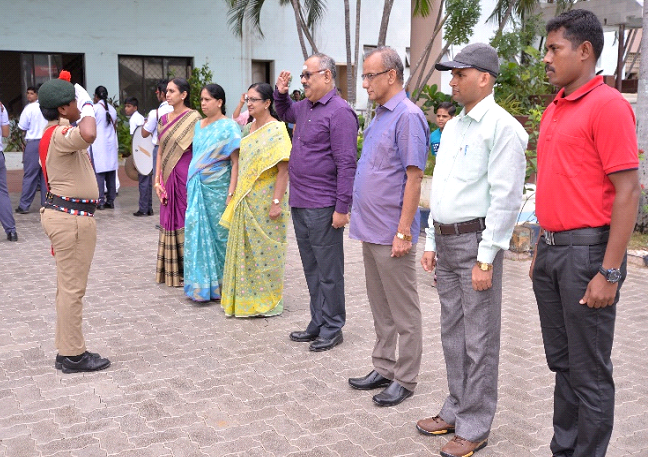 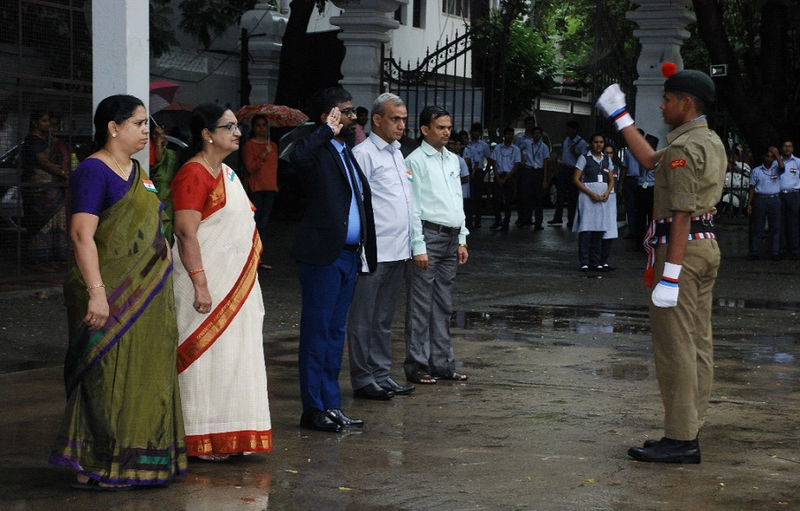 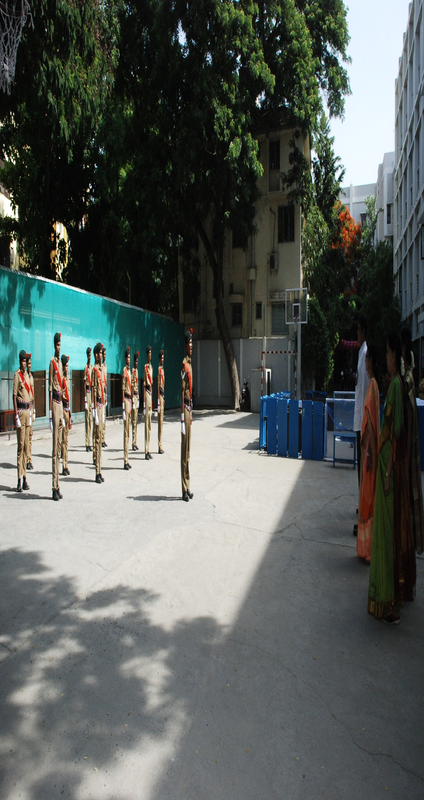 The Vidyalaya celebrated the 72nd Independence Day on 15th August 2018.Mr.V.Nandakumar, Jt.Commissioner.,Income tax,Ministry of Finance was the Chief Guest for the day. 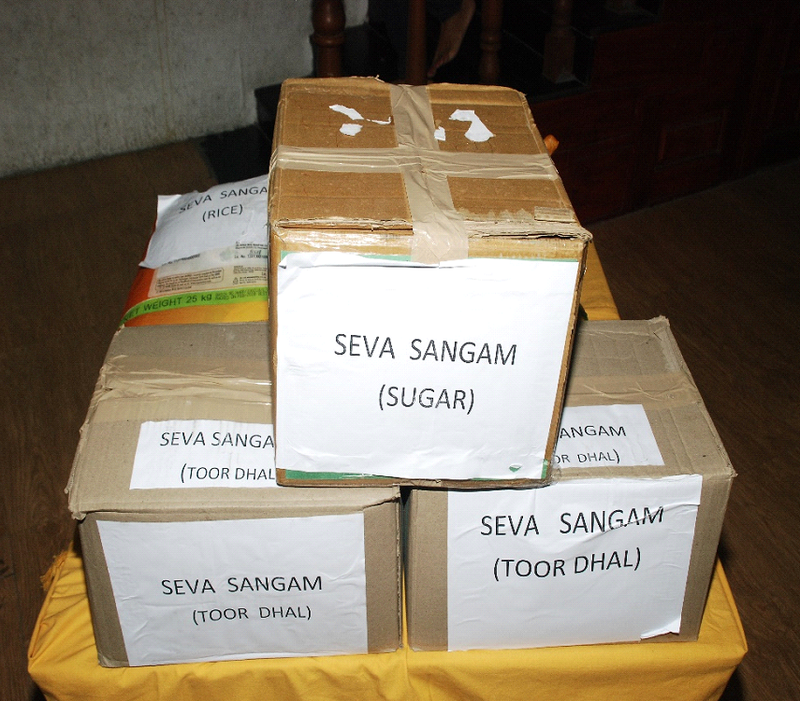 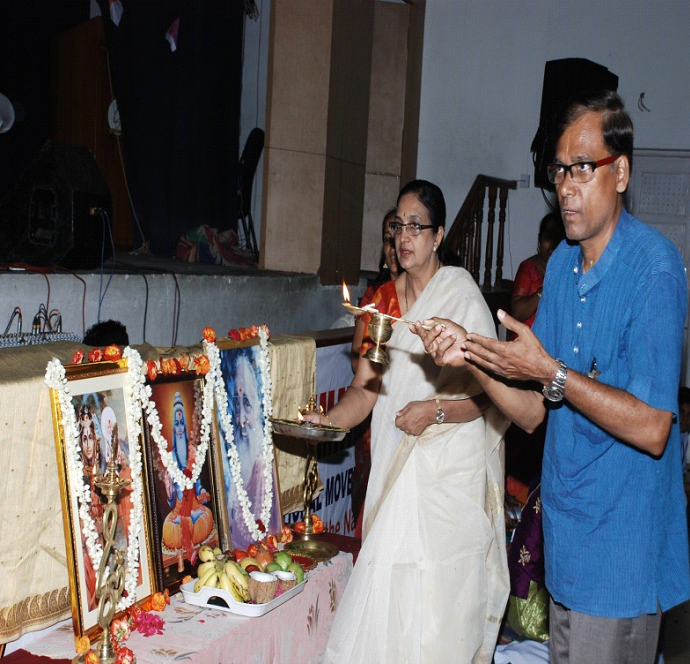 As a noble endeavor,pulses and food grains were distributed to an orphanage on the occasion of Aradhana day. 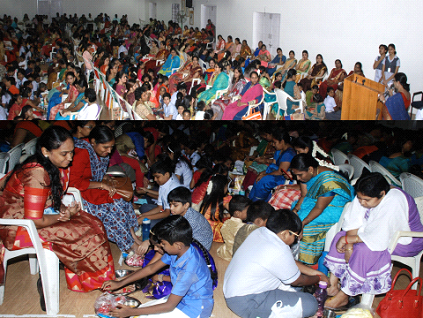 On Friday, August 3rd the Vidyalaya observed Aradhana Day of Pujya Gurudev with reverence and devotion . 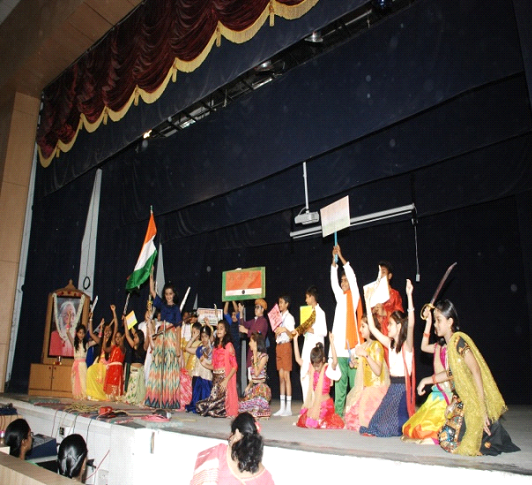 The Padukas were carried in a palanquin to the Auditorium amidst chanting of Bhajans and Gurudev’s Ashtotara nama by students. 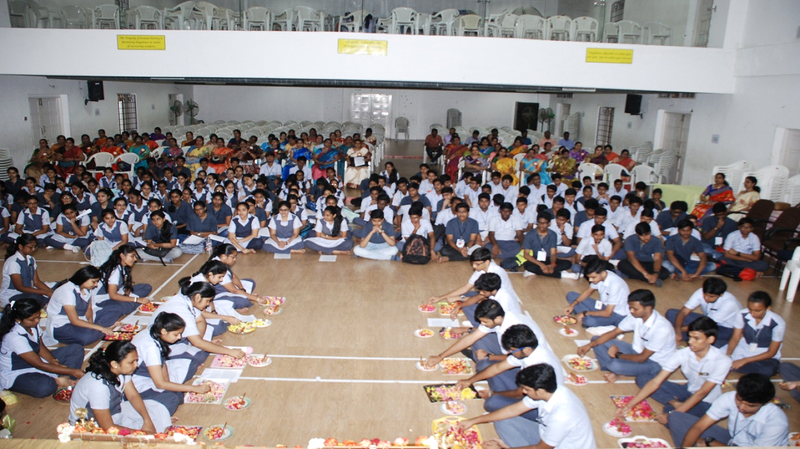 Students, Parents and staff of the Vidyalaya chanted Chapter 18 of Gita and offered flowers to Gurudev’s Padukas. 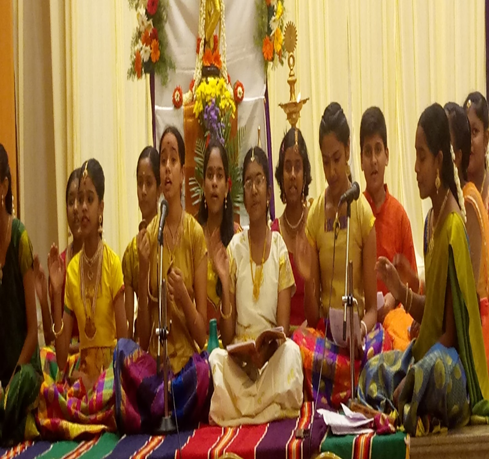 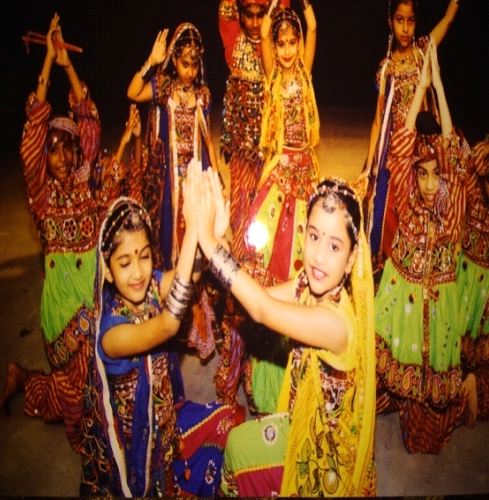 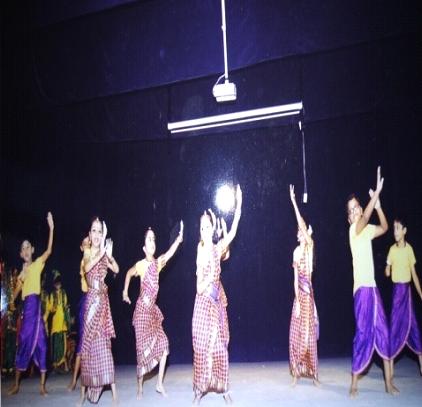 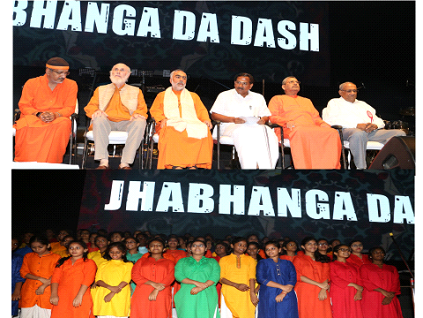 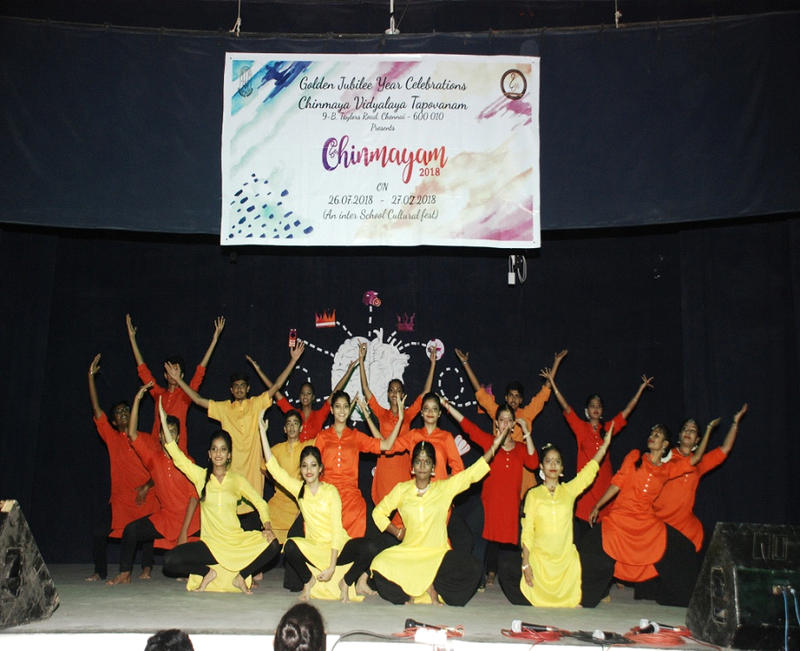 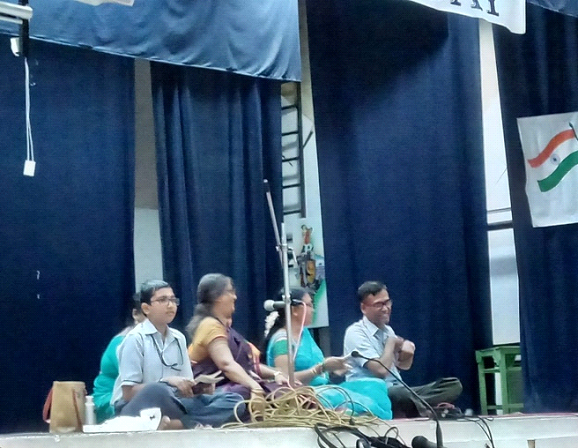 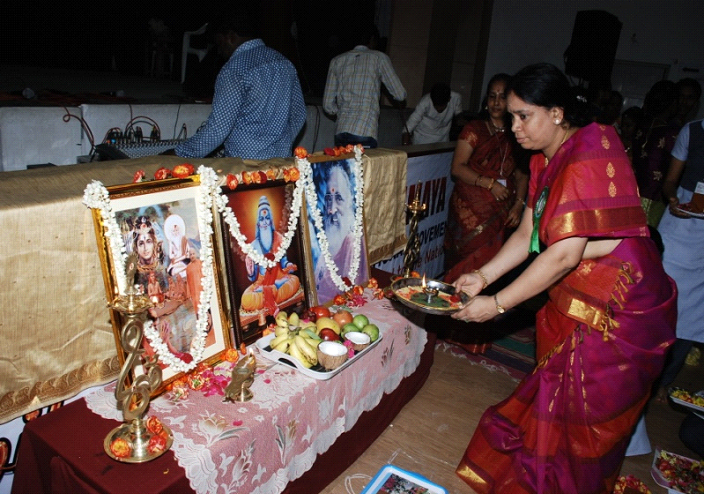 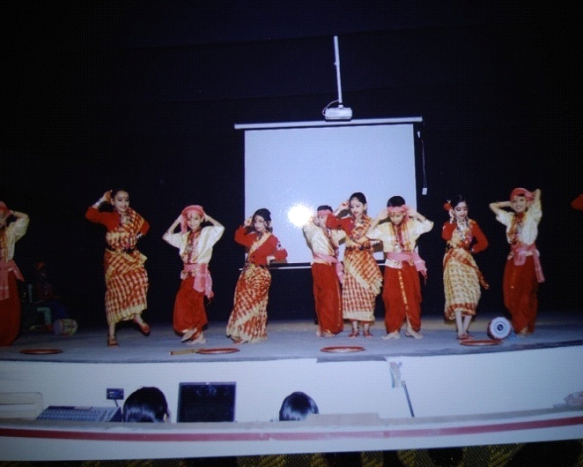 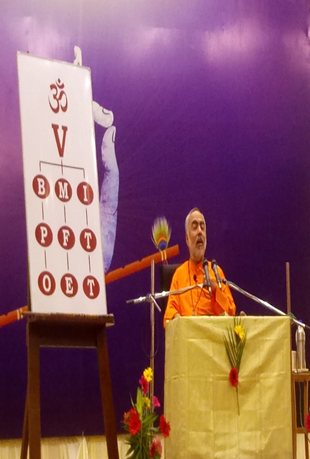 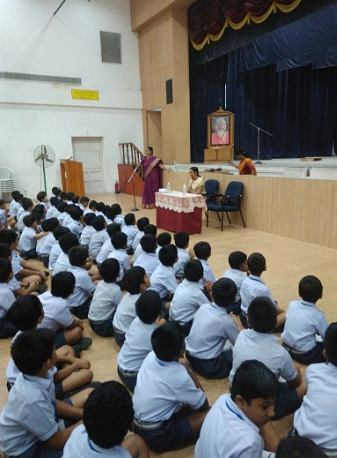 On 27th July the Vidyalaya observed Guru Purnima – Vyaas Purnima with great devotion and fervour. 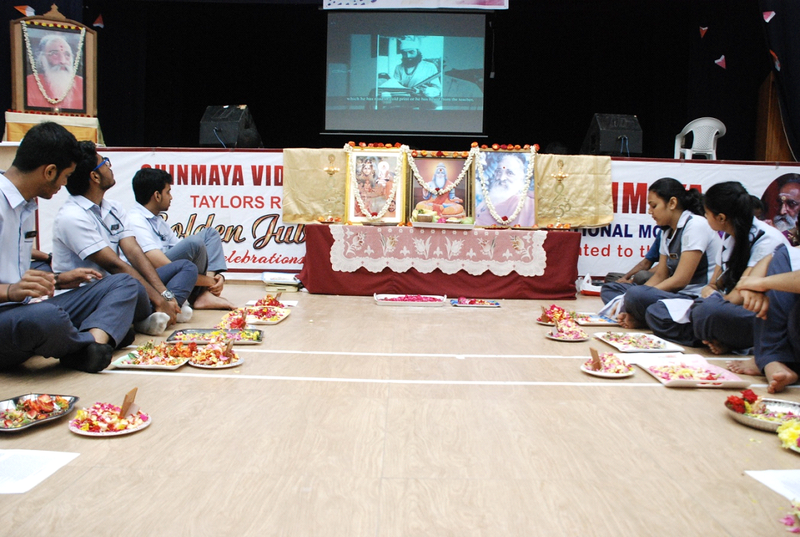 Students, teachers of the Vidyalaya sang bhajans and performed Puja to Ved Vyas and Pujya Gurudev. 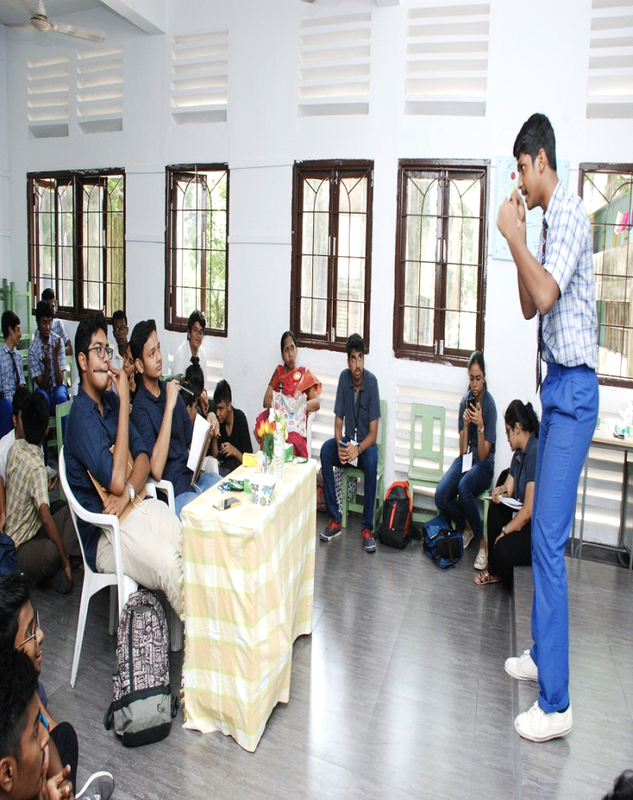 A counselling session was held for the students of class XII on 21st July 2018 by the members of SI-UK, a leading provider of independent guidance to students applying to universities in the UK. 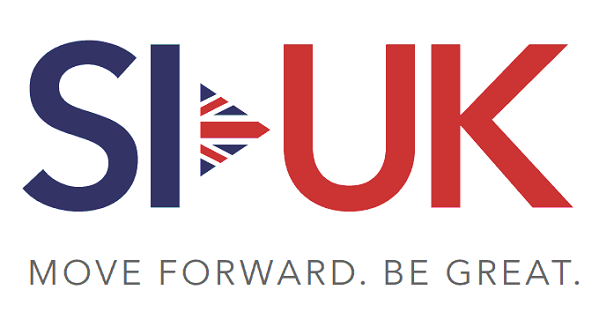 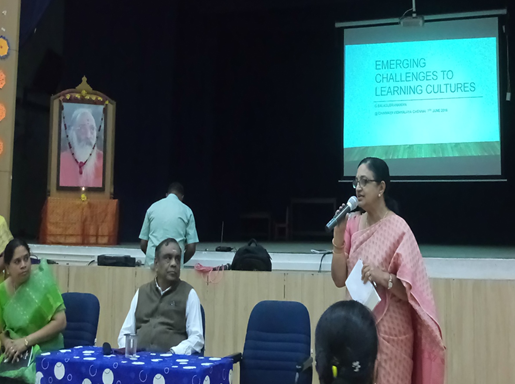 The session was held by Ms Sanofer Sultana, the chief educational officer of SI-UK. 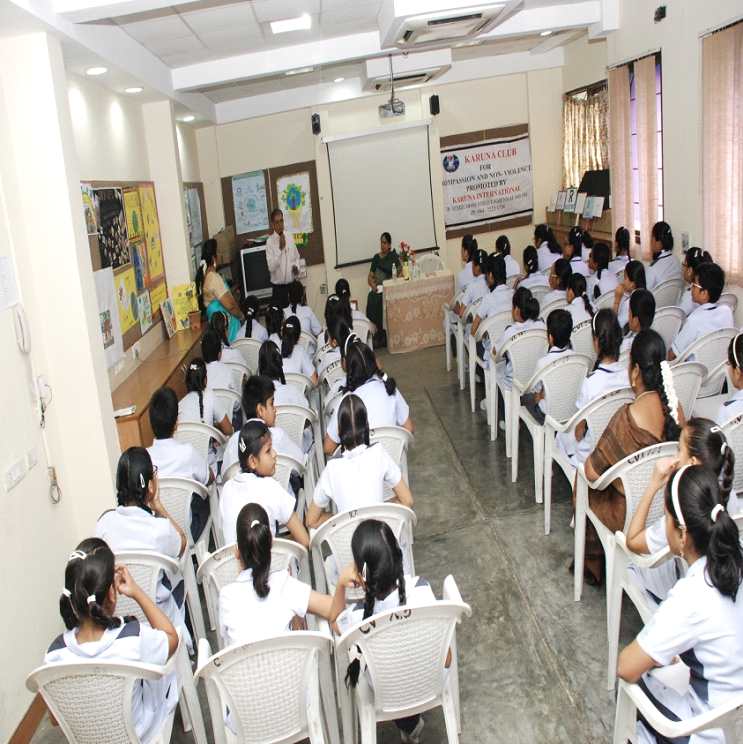 It was a very informative and enlightening discussion which will surely assist the students in deciding their future. 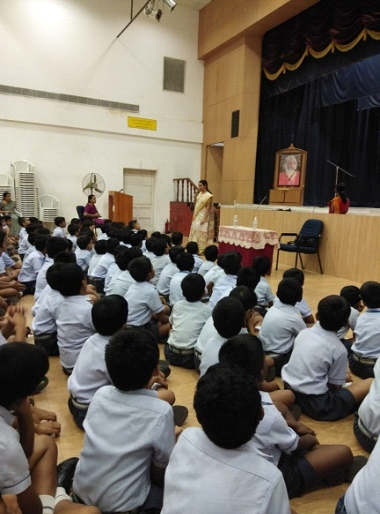 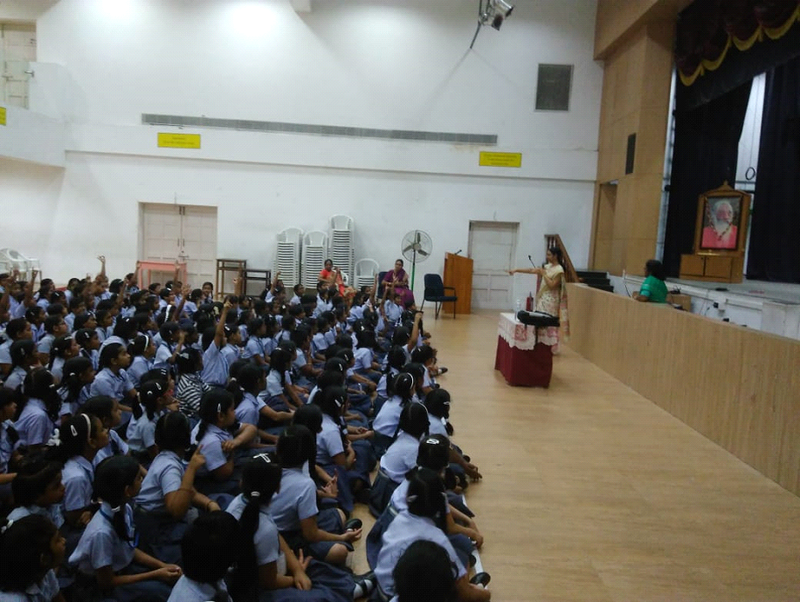 Dr. Selvi addressed students of Std 3,4 and 5 on 18th July 2018 on Good touch and Bad touch. 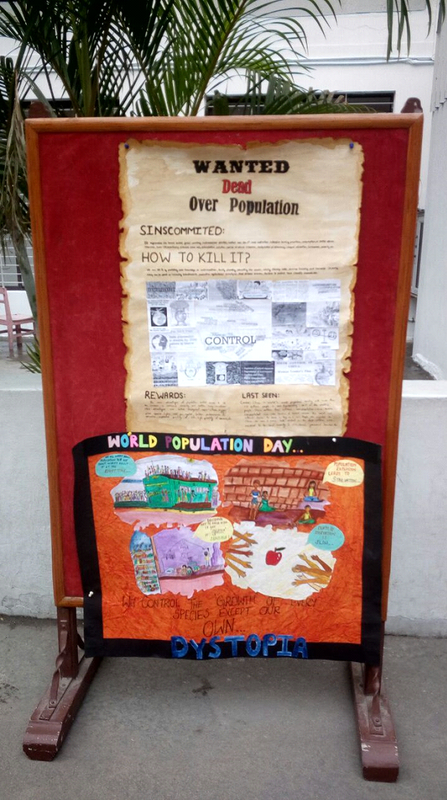 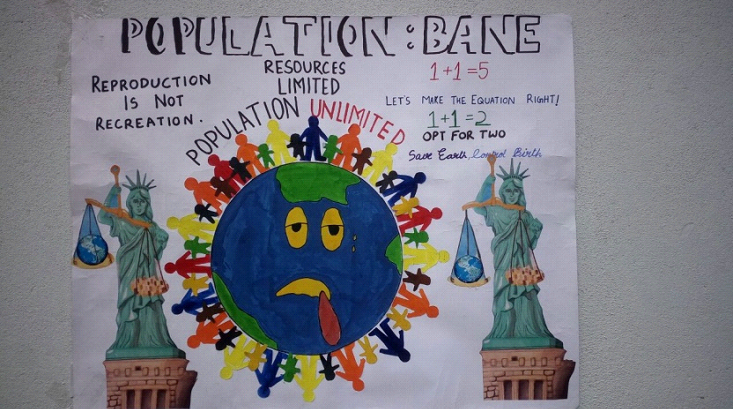 The students were sensitized on this issue . 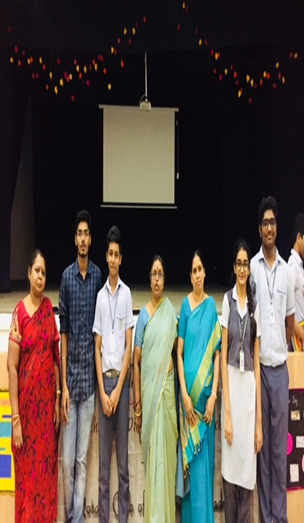 On July 4th 2018 CV Taylors Road set its foot in search of knowledge , a session with “think –a- thon’ of Cerebrus group was held in our Vidyalaya. 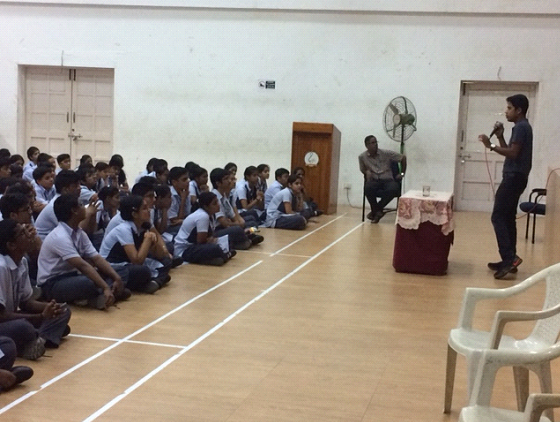 Many budding Quiz lovers with their parents assembled and got motivated by Mr. Abith’s interactive session. 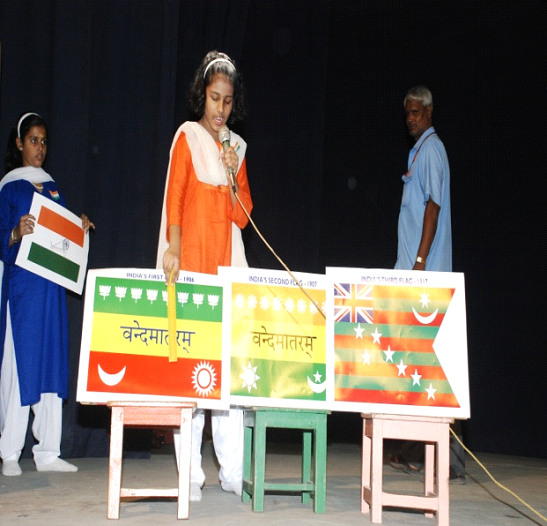 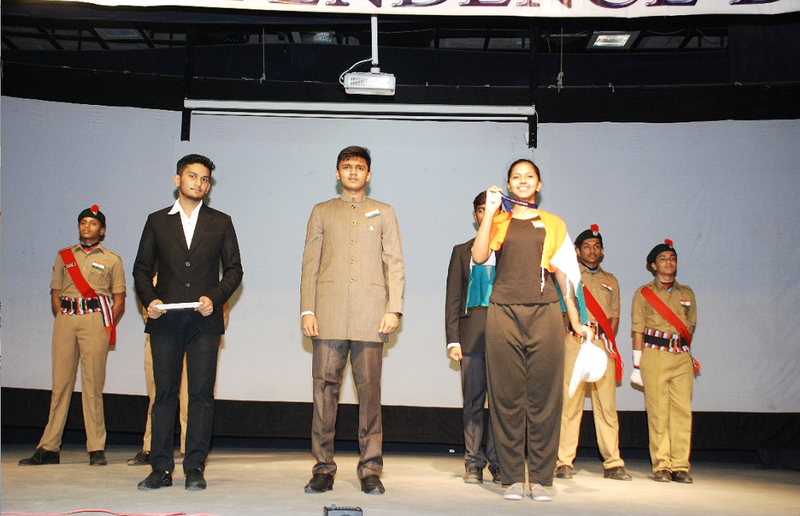 The session consisted of a mock quiz which included visual round, science, current affairs movie’s etc. 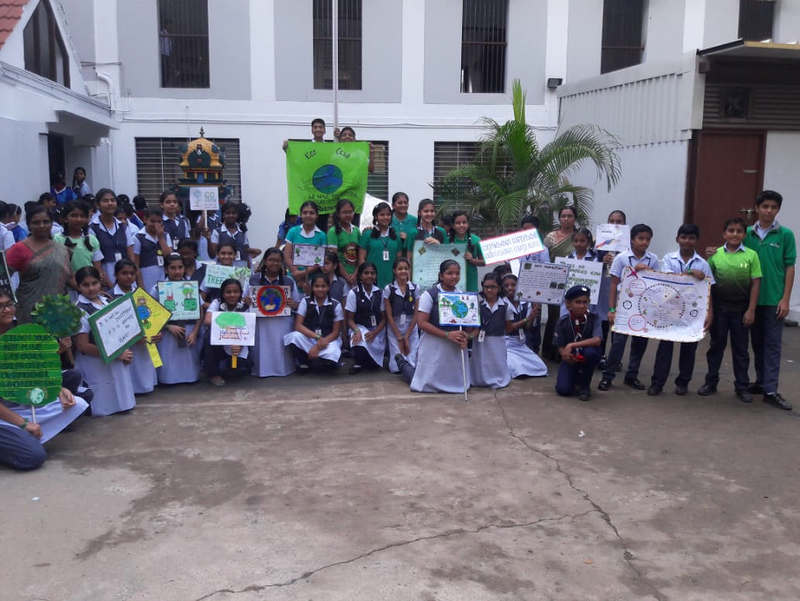 On 3rd July 2018 the students of Eco Club, Karuna club, Seva Sangam, Scouts and Guides together joined hands to spread the message of Van Mahotsav. 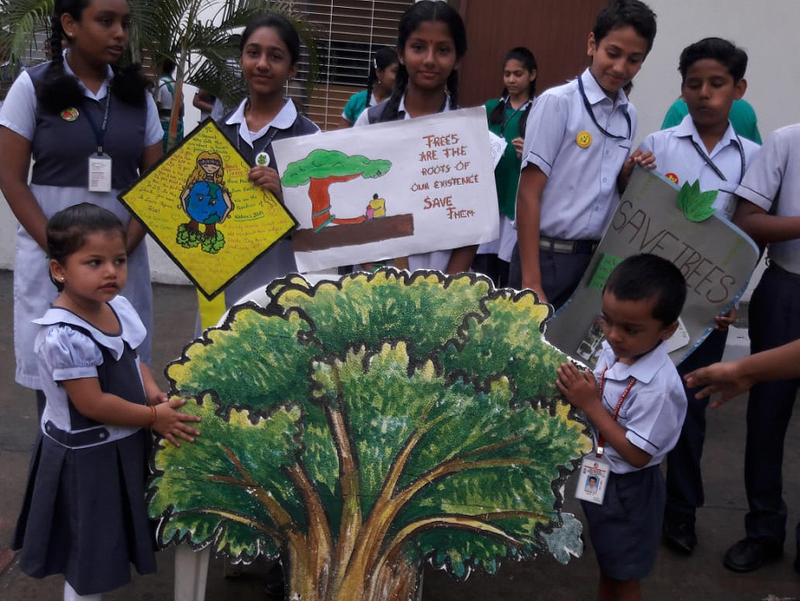 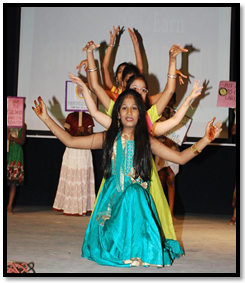 The students formed a human chain holding the pluck cards with valuable messages on afforestation They performed a street play on ‘Save Tree’ that helped in conveying the message that how by saving trees we can save the environment. 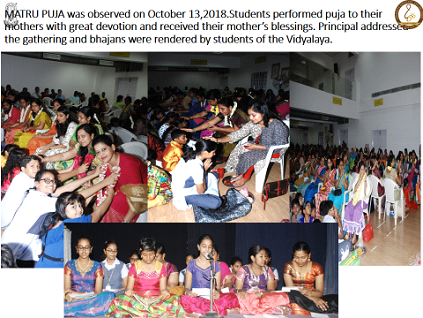 On Friday,3 rd August the Vidyalaya observed Aradhana Day of Pujya Gurudev with reverence and devotion . 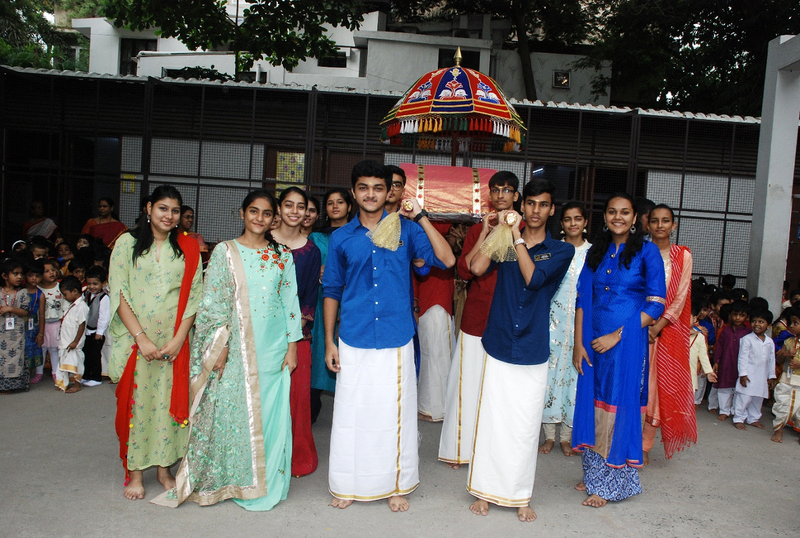 The Padukas were carried in a palanquin to the Auditorium amidst chanting of Bhajans and Gurudev’s Ashtotara nama by students. 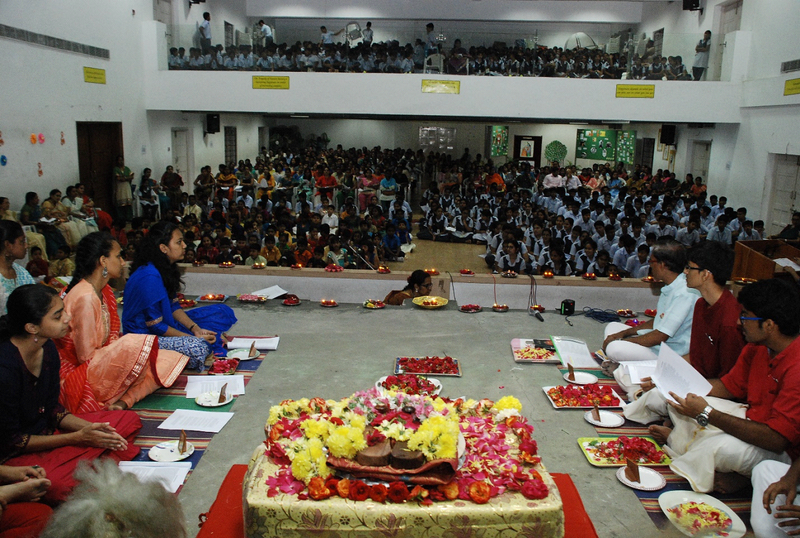 Students, Parents and staff of the Vidyalaya chanted Chapter 18 of Gita and offered flowers to Gurudev’s Padukas. 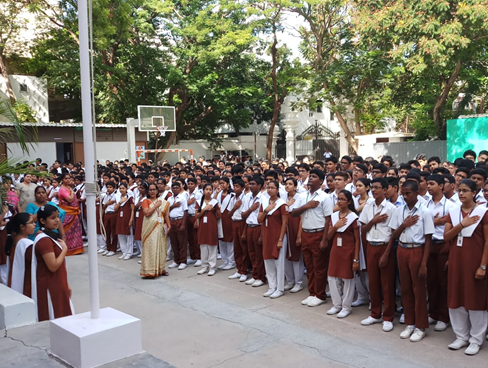 “A leader is one who knows the way, goes the way and shows the way” The new batch of leaders took oath on 20th June 2018 in the presence of Principal,Mrs.Valsala Gopakumar and Vice Principal, Mrs. Geetha Ganesh. 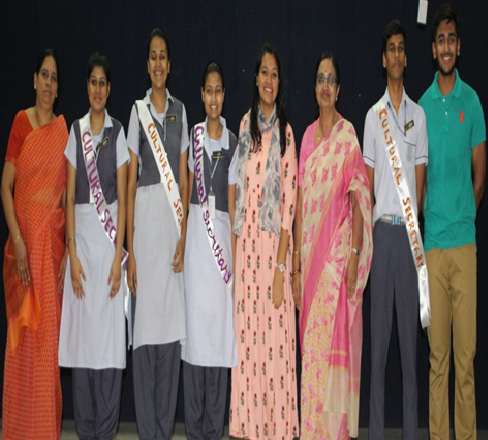 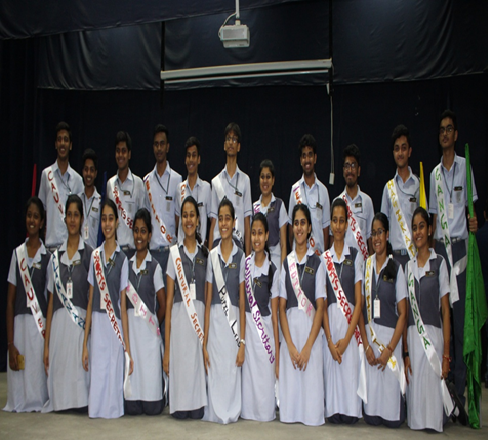 The former leaders presented the sashes and the Principal pinned the badges. 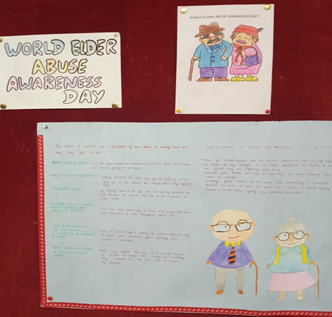 WHO observes June 15 as World Elder Abuse Awareness day every year. 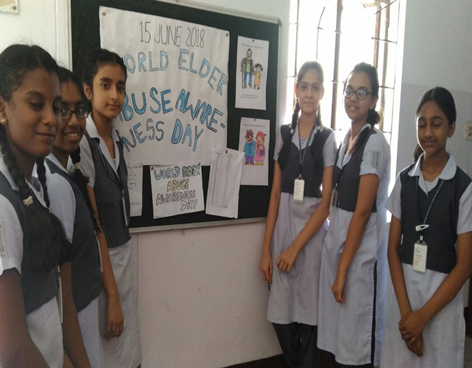 The students of CV – Taylors road took a pledge on June 15 2018 to respect, revere and raise their voice against injustice to Elders. 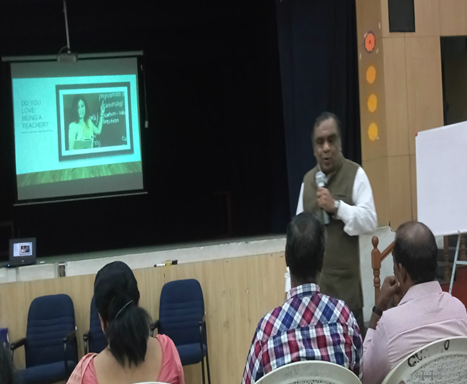 The teachers of class IX to XII were exposed to wonderful session by Mr G Balasubramaniam on 7 June 2018 at Chinmaya Vidyalaya .The session was really educative and provided insight to all the teachers to make teaching learning an innovative one. 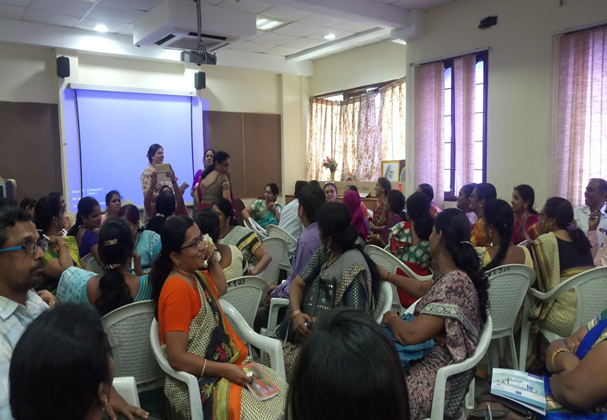 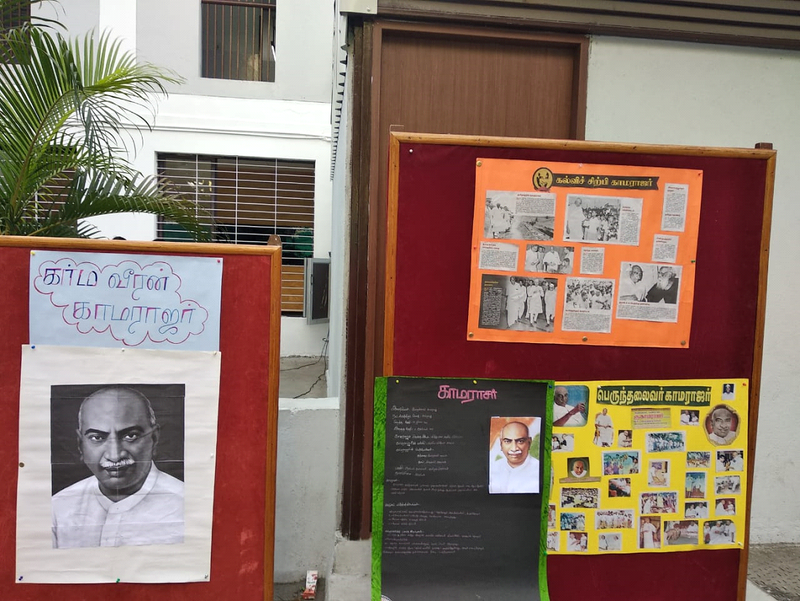 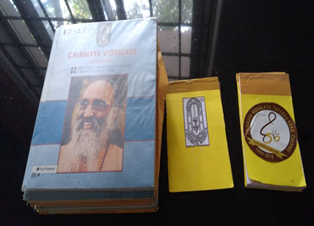 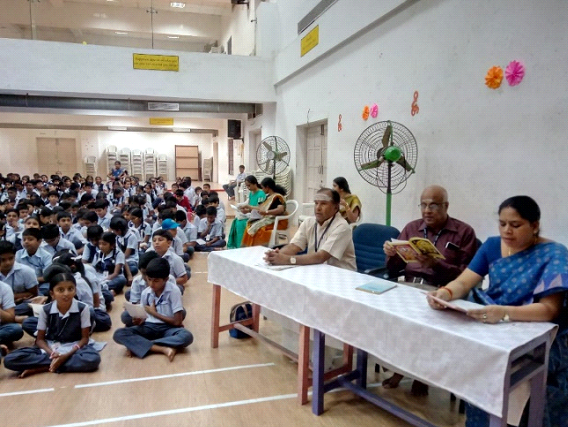 Saraswathi publications organised a workshop at Chinmaya Vidyalaya Taylors Road on 6 June 2018 for the teachers of class VI to X. 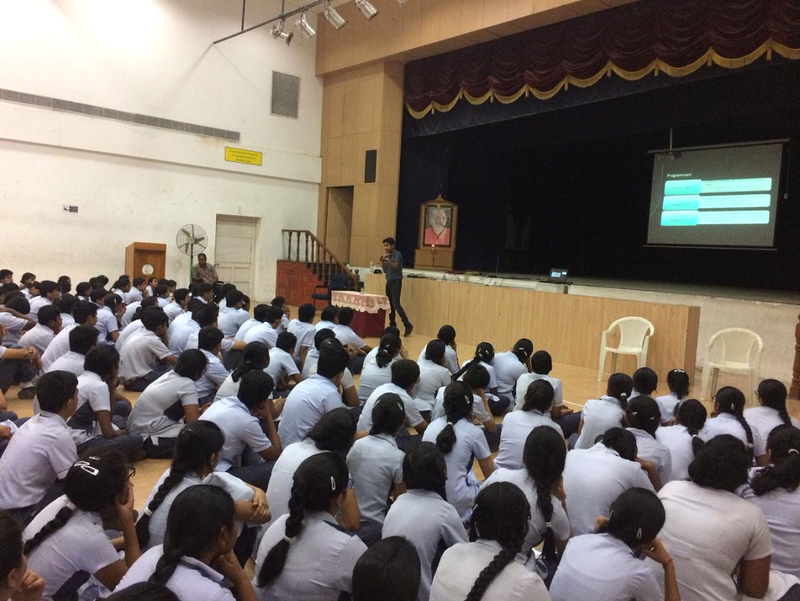 The Resource person Mr David Mohan explained in depth the need to be connected. 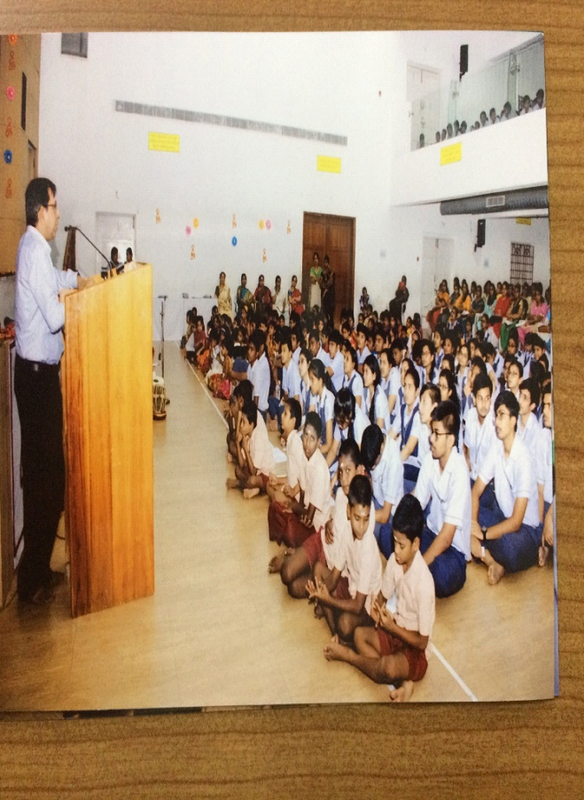 Mr David Mohan highlighted the importance of goal setting and the course of action one must take to achieve the goals. 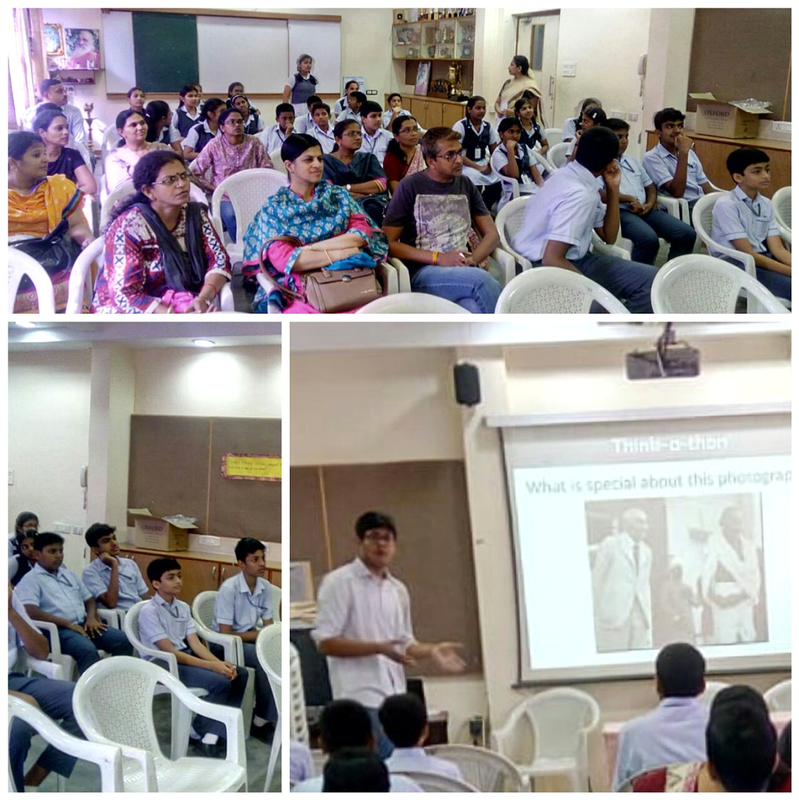 Workshop on ‘Motivation’ was organised by the Oxford University Press in Chinmaya Vidyalaya Taylors Road on 5 June 2018 for the teachers of Class VI to VIII. 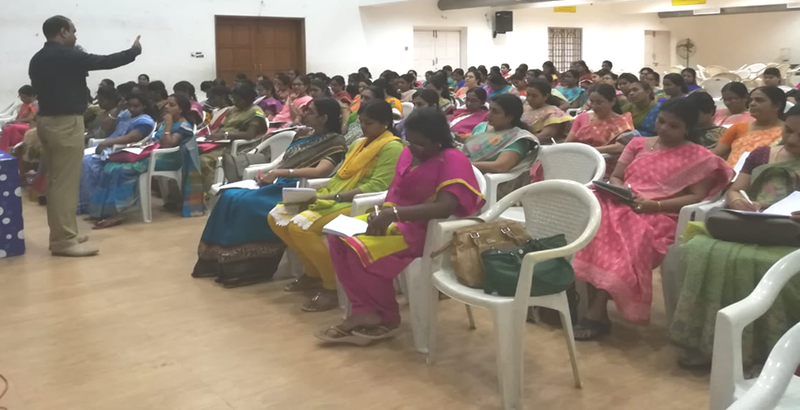 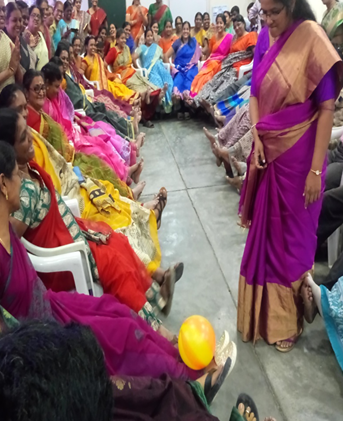 The Resource Person Mrs Shyamala Ramesh Babu explained in detail the need to be motivated so that we grow from the fantasy stage of a teacher to a teacher who creates an impact. 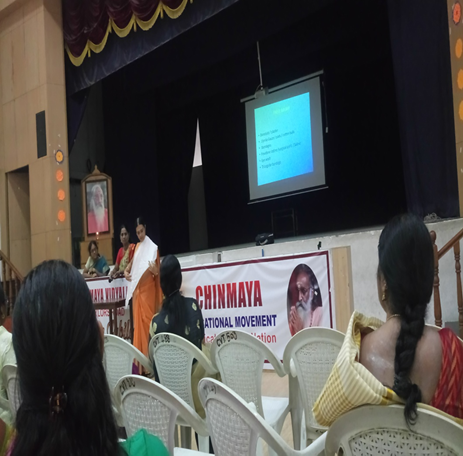 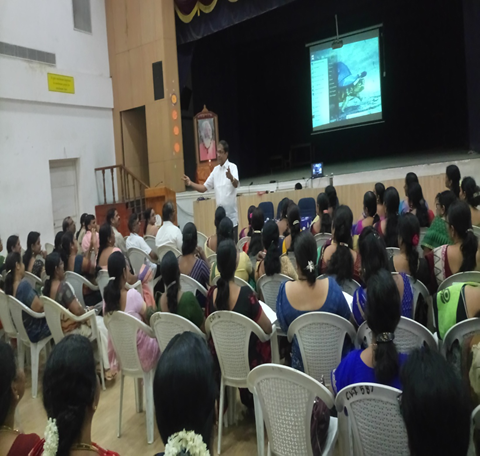 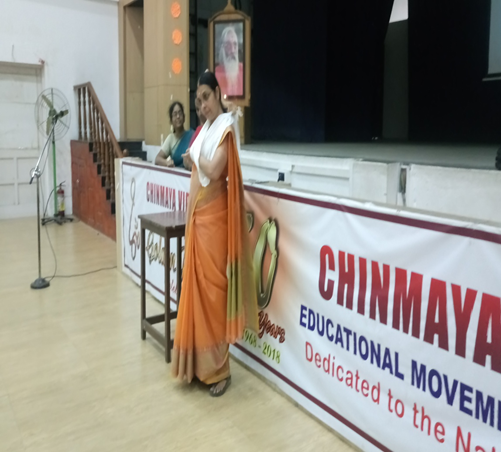 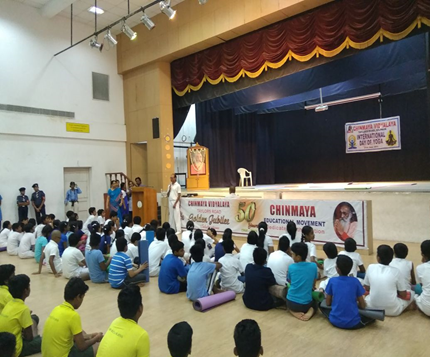 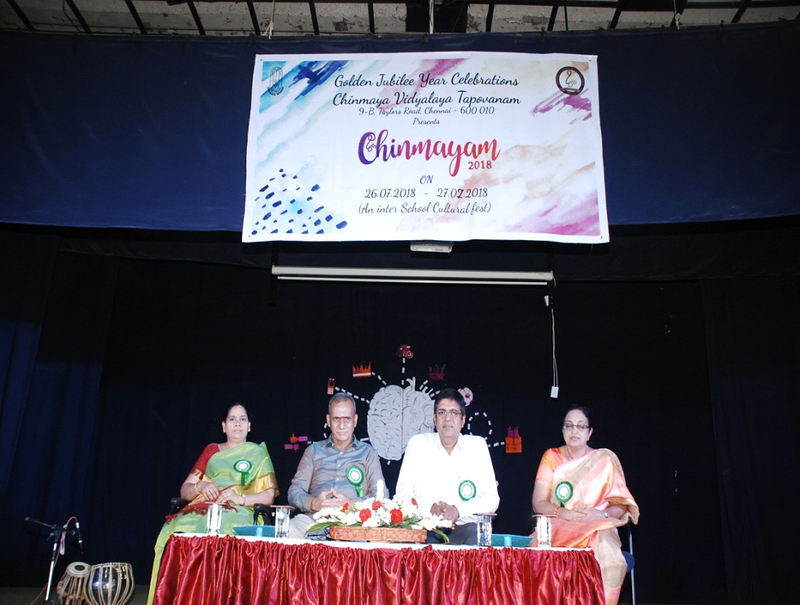 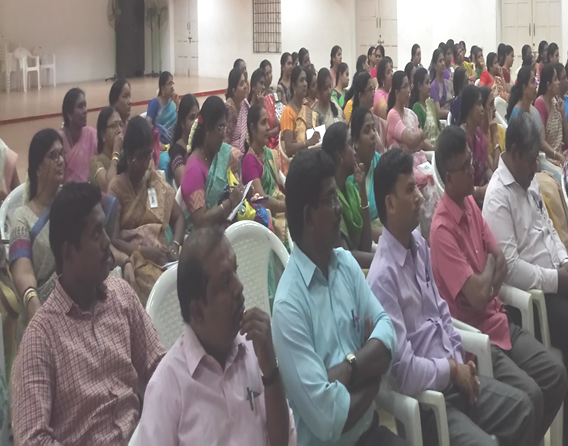 Teachers of Chinmaya Vidyalaya Taylors Road were exposed to an excellent session on the Chinmaya Vision Programme, the fulcrum of all the activities of the Chinmaya Mission on 4 June 2018. 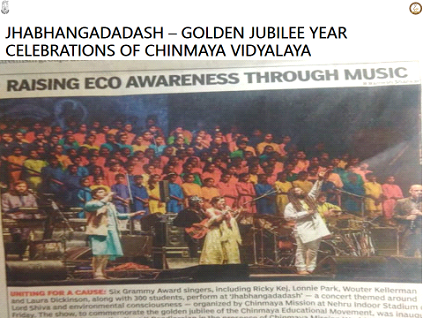 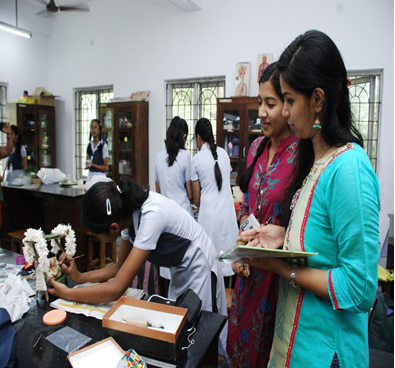 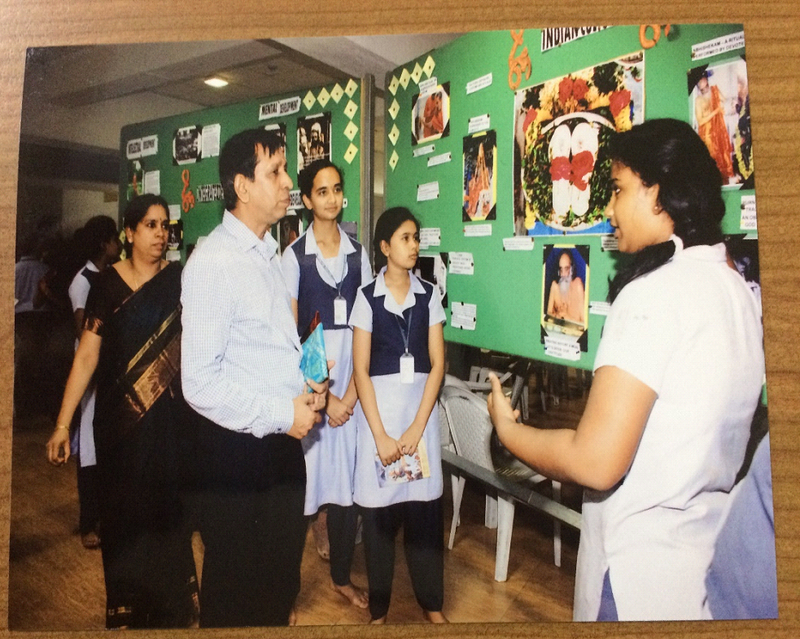 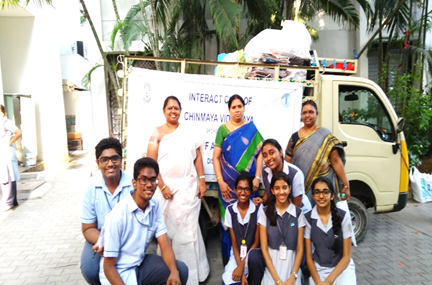 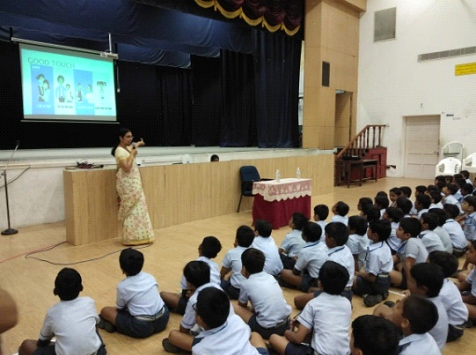 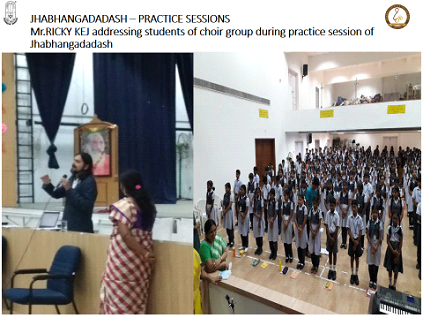 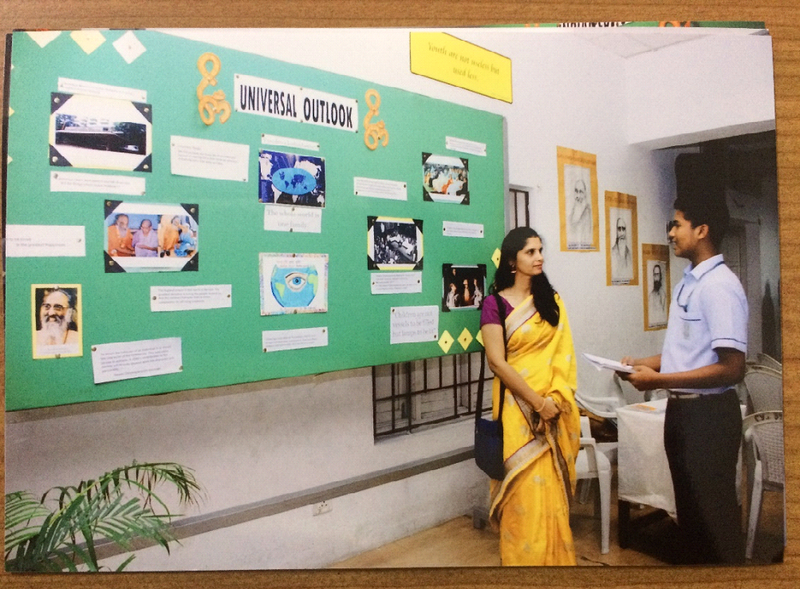 The session was conducted by Mrs Vijaya Devanathan, a senior teacher of Chinmaya Vidyalaya Taylors Road. 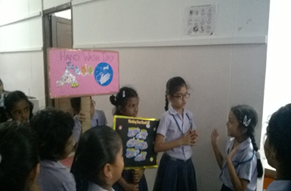 She explained the CVP aspects with lot of examples on how CVP can be implemented while teaching in the class. 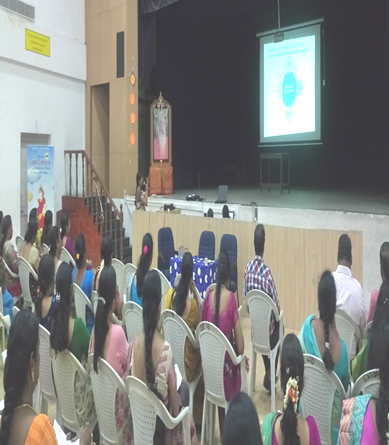 A Session on First Aid was organised for the teachers at Chinmaya Vidyalaya Taylors Road on the 24 April 2018. 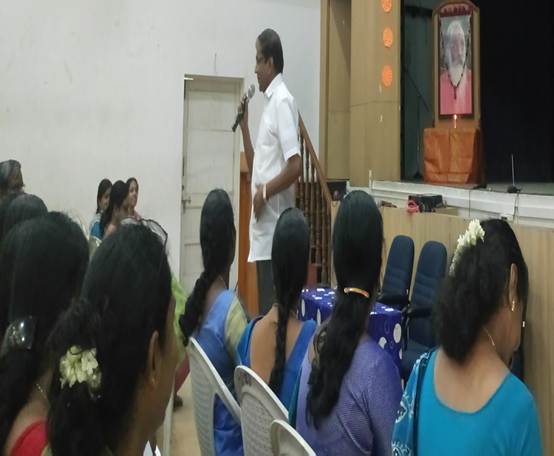 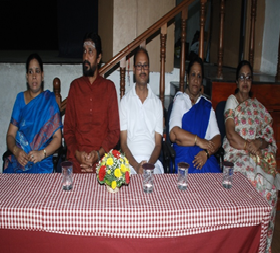 The resource person Dr Selvi, a gynaecologist at Padma Nursing home explained through an informative power point presentation the common problems health problems faced by students and how teachers can combat them. 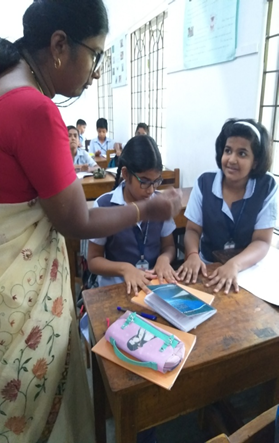 Dr Selvi explained the ABC of First Aid, Airway, Breathing and Circulation and how to handle students with sprain, fracture, cramps and fits. 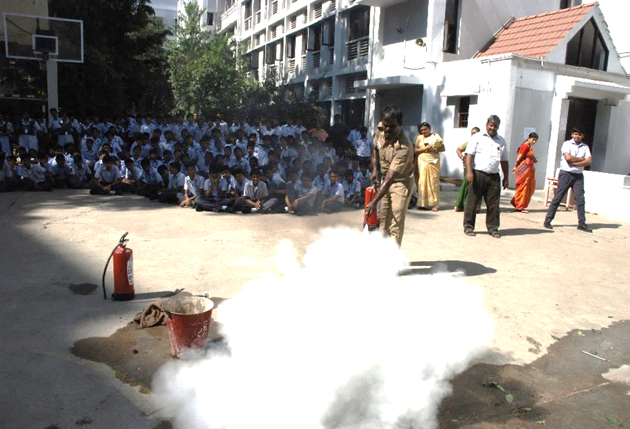 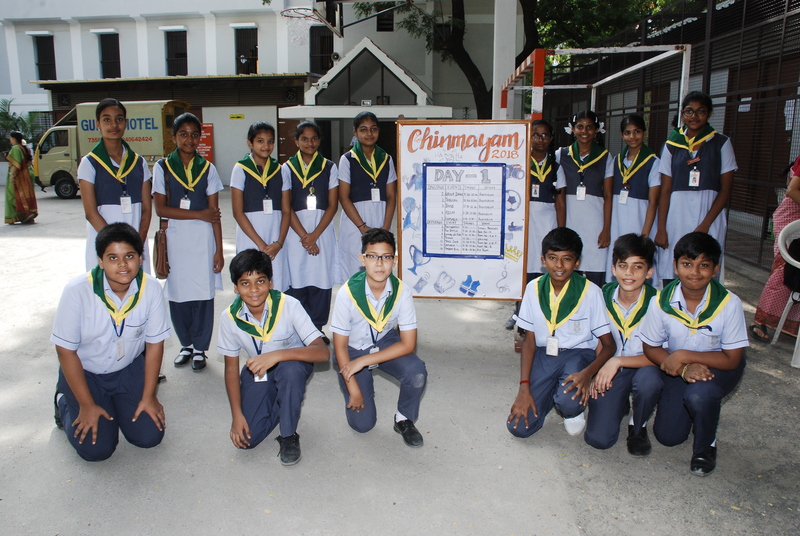 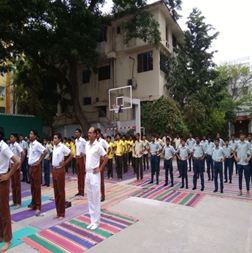 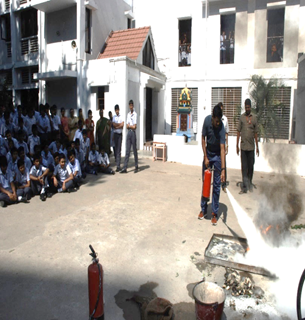 A Session on Fire safety was organised in Chinmaya Vidyalaya Taylors road on 17 April 2018 for the students of class VIII to X. Mr A K Kumar and Mr Elangovan from the Kilpauk and Vepery Fire and Rescue Cell elucidated how a chemical reaction takes place and the different methods of extinguishing fire like the cooling method, smothering method, solidification and extinguishing method. 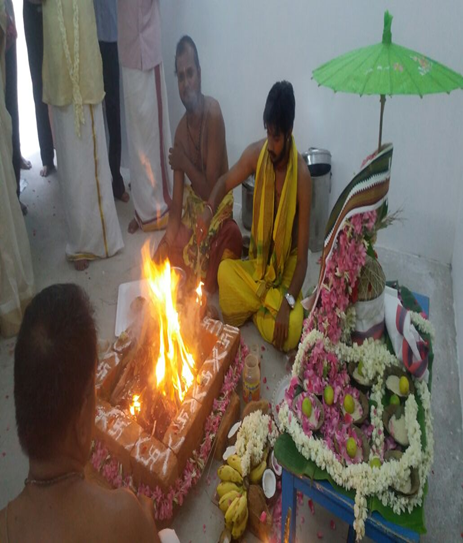 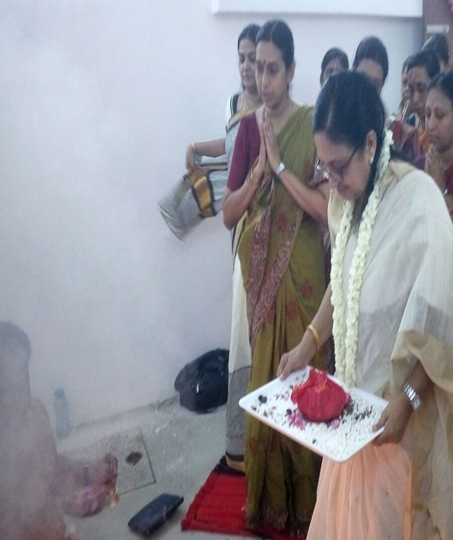 The Vidyalaya commenced the new academic year with the Ganapathy Homam to invoke God’s blessings for an auspicious start . 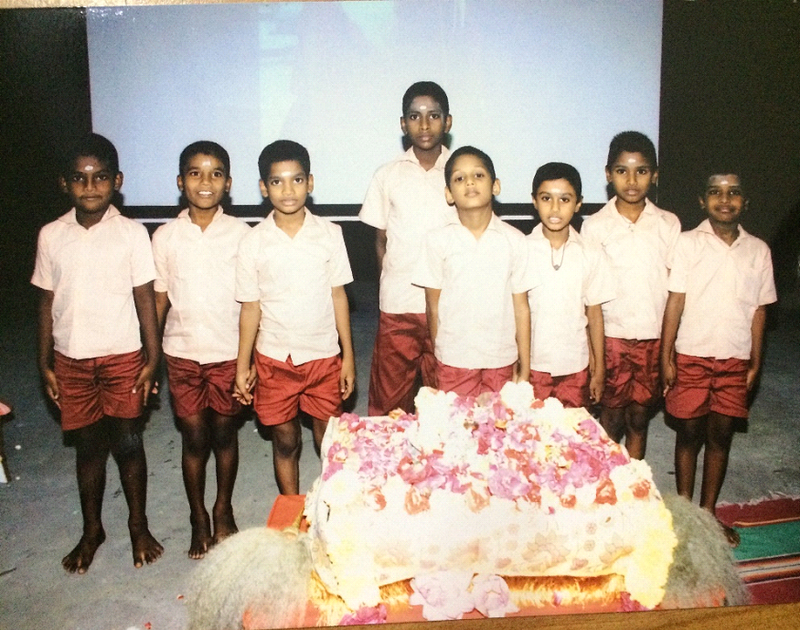 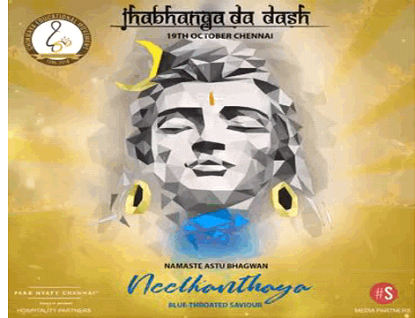 Address: Tapovanam, 9B Taylor's Road, Kilpauk, Chennai-600010.